﻿ A Brief History of the Book of Revelation. Chapters 1 – 13.
churchages.net » English » Bible Studies to help you » A Brief History of the Book of Revelation. 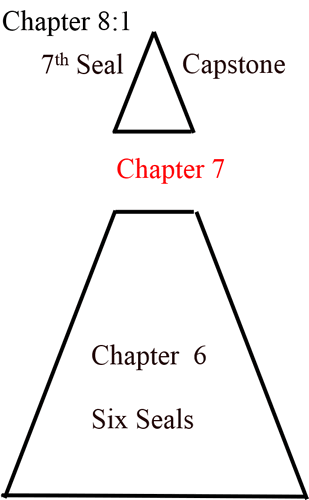 Chapters 1 – 13. Chapter 1 Introduction to the history of the church during the 2 000 years of the church ages. Christ is the Alpha and Omega, the Beginning and the ending, the First and the Last. The whole focus of this Chapter is on the central Character, Jesus Christ. 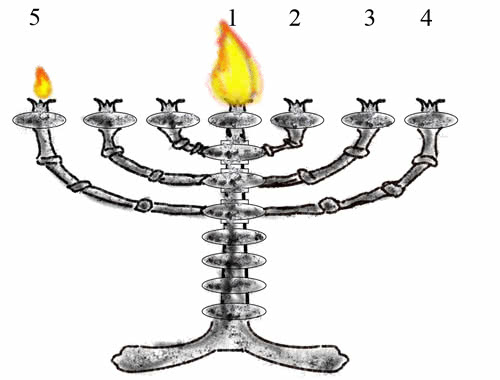 Then seven candlesticks introduce the mystery of seven churches with Jesus walking in their midst. Each church introduces the characteristics of an age in church history. The seven local churches mirror the effects on each church age as the conditions in which the church age found itself changed, and how these changes affected the church. The original good church at Ephesus represents the first church age that was started by the apostles as the New Testament Scriptural church. As the cities are displaced away from Ephesus, so the church will decline into the Dark Ages as it moves away from Scripture. The turning point is the third church age represented by Pergamos which was the political capital of Asia Minor. At the Council of Nicaea in 325 AD the Roman emperor Constantine took over political control of the church, forcing it to believe unscriptural words and embrace pagan beliefs. But, moving on, we see that the cities, starting with the fifth city, begin to obviously move back down towards the level of Ephesus and so the church will begin to return to Scripture in the Reformation. 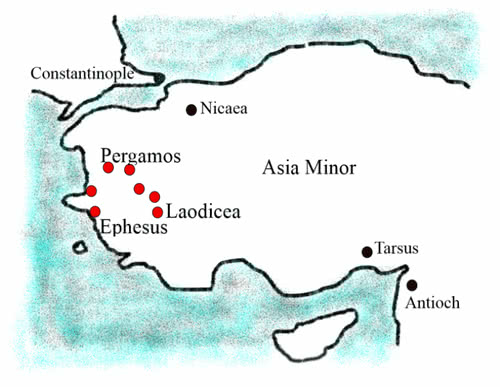 The last church age of Laodicea is level with Ephesus so it will have to be just like the first church age. Only the first and the last church ages have the full truth. Jesus, the Word, is the Truth. The seven stars represent messengers in the right hand of the Power of Jesus, who will guide the church through each age. John collapses before Jesus with His white Judge’s wig of wool. He judges by the Word, the Bible. His eyes like a flame with anger and fury towards those who deviate from His Word. The girdle of judgement around His chest. His feet walked through the fires of hell for our sake to dump our sin on the Devil. Are we prepared to walk through opposition and criticism for Him? Or do we just agree with our church to achieve popularity. 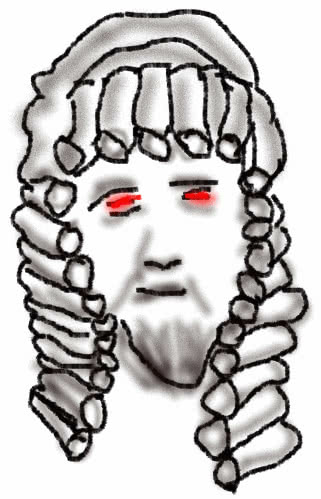 He wears the woolen wig of the Supreme Judge. This Chapter lays out the church ages as Christians moved away from the first church and fell away into the Dark Ages. Ephesus was the original strong first church that set the example for all ages. The fire was lit by the Holy Ghost Who descended on the apostles in the upper room on the day of Pentecost. The apostles themselves then established the early church and wrote most of the new Testament Books. No one can improve on the early New Testament church. With time they relaxed and lost their first love of the Bible. Human leadership took over the church. Nico means conquer. Conquer the laity. Elevate a holy man above the congregation. God hates this. If you re-arrange the letters of LAITY you get ITALY. This is the home of the most dictatorial church, Roman Catholicism. Completely subject to its human leader, the Pope. Every Catholic church is completely subject to the local priest who is the head of the church. The apostles never put one man in charge of a church. The word "pastor" is only mentioned once in the New Testament which gives him no Bible authority to rule a church. A shepherd is never called a pastor in the Bible. Christians are all priests, making all Christians equal. Thus no one Christian is above other Christians. A shepherd feeds the flock. This responsibility in the church was not given to one man but rather to a group of elders. Paul, near the start of the New Testament set up the church as Ephesus which, as the Ephesian church age, was to be the example and foundation for all later churches. :17 And from Miletus he sent to Ephesus, and called the elders of the church. Peter, near the end of the New Testament, says the same thing. :3 Neither as being lords over God's heritage, but being ensamples to the flock. Ministers are servants and must not try to elevate themselves above the flock. The local elders had to oversee and feed the church. They did it as a group. There was no one-man leader. There is no mention of a pastor. So the job of a shepherd, which is to feed the sheep, was given to a group or team of local elders. Each elder is equal in rank. There are none in the five-fold ministry who are above the elders. The five fold ministry are also elders. Peter writes to the elders as a fellow elder. He does not try to elevate his rank as an apostle to claim that he is above the elders. The prophets wrote the Old Testament. The apostles wrote the New Testament. So if the elders stick to the written Bible then they are already saying what the prophets and apostles said. Then those two ministries are already present in the church. Not every elder is a preacher or teacher. Some elders preach and some do not. But they are all of equal authority. The wisdom to handle problems and people’s relationships is not confined to preachers and teachers. Encouraging, correcting, and helping people is a role that any elder can perform. Preachers are ministers which means that they are servants. When servants do a job, they don’t seek the limelight. They don’t seek to dominate. They have no desire to be important. They do the job as un-noticed as possible and move on. No minister who is a servant of God does his job anywhere near perfectly. We are unprofitable servants: we have done that which was our duty to do. God makes no profit out of His servants. That means God could have done the job better without human efforts. Ministers are more part of God’s problem than of His solution. Jesus and John the Baptist were never polite to the Jewish religious leaders. It was the Jewish leaders who persuaded the Jews to kill Jesus outside the city of Jerusalem. So who is responsible for Jesus being outside the church door in Laodicea? He is outside every church because there are no exceptions mentioned in the Laodicean church. Who is the head of the church that is inside the church? The pastor. A body cannot have two heads. So the true Head, Jesus, has to stand outside the church. The apostle John, in his last letter, warns us about a church leader who usurped power over his church to reject the Scriptural John and kick people out of the church who disagreed with the leader. Today this power is usurped by the pastors who say, “This is my church. Do as I say or leave”. III JOHN 1:9 I wrote unto the church: but Diotrephes, who loveth to have the preeminence among them, receiveth us not. The love of preeminence. The pastor loves being elevated above the congregation. The first sin in Heaven was pride. "I am above you. Better than you". Racialism was not a New Testament issue. The Roman emperor Claudius banned Jews from Rome as well as Christians who he thought were part of the Jews. So Jews and Christians were scattered. Peter addresses all strangers who believe in Jesus. Scattered around the different countries because of persecution. The Christians were small groups. Now, do you know, when those early men went out, sometimes there were only about six or eight of them, together? And they shook the country. Well, you know, when Aquila and Priscilla, that great revival that Apollos was having over there, there was only about six or eight men and women in that bunch. That whole church, meant six or eight. You got five or six, seven times as many here tonight as they had then. You know, Jesus only had twelve apostles. We always thinking for something big. But God don't deal in them big numbers. It's in these little groups is where He gets it. See? Look all down through the age, at any time He ever met with men. It was in small groups, see, and spoke with them, and ordained them. It's God's good pleasure to do that. That's the way He likes to do it. And now we just want to keep God in our midst, and go, doing these things. You know, some of our most spiritual gatherings has been where two or three are gathered together, He's there. I'm sure that most all Christians can refer back in some manner to sometime when we had just a little group, just a little cottage prayer meeting of some sort. It's where I some of my most blessed times, when the Holy Spirit would really come into our midst and bless us when we had little small meetings. He has made that promise that the smallest of church, "two or three gather in My Name I'll be in their midst." Christians are all priests. There was no-one above a priest except for the high priest Who is Jesus. Thus we are all equal. No man is elevated above you. To a born again Christian there is only one race, the human race. We all had different backgrounds that we called different races. But born again people all belong to God. He is our Father and we are brothers and sisters. There is only one family in Heaven. Christians are not from different races, they are all from one family. Family members do not come from different race groups. Song of Solomon is a love song between Solomon and a black woman. :10 And the cloud departed from off the tabernacle; and, behold, Miriam became leprous, white as snow: and Aaron looked upon Miriam, and, behold, she was leprous. God did not punish Moses for marrying a black woman. He punished Miriam for objecting to the marriage. Physically there are differences between race groups but born again people associate with each other on a spiritual level as forgiven sinners, who are called purely by the grace of God. We are not saved by anything that we have done in the flesh. Our salvation lies in believing the promise of God. In terms of the flesh we are from different nations. But born again of the Spirit we become heirs to all the promises that God made. There is no colour bar in the Spirit of God. So God does not recognize differences in colour. A black man, Simon of Cyrene in North Africa, helped Jesus carry His cross. This was the only time that Jesus needed help. When you are desperate for help, you do not worry about the colour of the skin of the person who is helping you. Born again people have all received a portion of the Spirit of God. God’s Spirit divided up into 120 portions on the day of Pentecost. All 120 people had the same Spirit, so in the spiritual realm, they all had the same colour. Whatever the colour of the Spirit is, they all had the same Spiritual colour. This does not apply to gender because God has both male and female attributes. Men and women are equally saved and equally heirs to God’s promises. But the portion of the Holy Spirit in a male is masculine and the portion of the Holy Spirit in a woman is feminine. 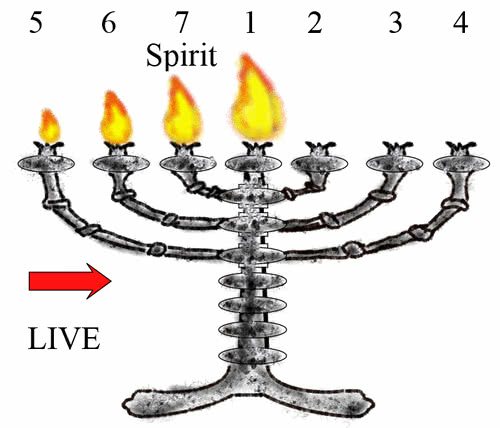 So the first church age Ephesus can be represented by a seven-branched candlestick that has a central flame that was originally lit by the Holy Ghost on the day of Pentecost. Smyrna was the second church age that experienced much bitter persecution by Roman emperors which scattered the Christians to spread the Gospel and slowed down the decay of the church because they had to leave the cities where the corrupt teachers were situated. A new habit started. A man was promoted and called the bishop of a city. This was unscriptural. The city of Philippi had many bishops. Now this doctrine actually started as a deed in the first age. It appears that the problem lay in two words: 'elders' (presbyters) and 'overseers' (bishops). Though Scripture shows that there are several elders in each church, some began (Ignatius among them) to teach that the idea of a bishop was one of preeminence or authority and control over the elders. Now the truth of the matter is the word 'elder' signifies who the person is, while the word 'bishop' signifies the office of the same man. The elder is the man. Bishop is the office of the man. 'Elder' always has and always will refer simply to a man's chronological age in the Lord. He is an elder, not because he is elected or ordained, etc., but because he IS OLDER. He is more seasoned, trained, not a novice, reliable because of experience and long standing proof of his Christian experience. The flame of the original church was starting to get dimmer. Human opinion was starting to replace Bible doctrine. They were Satan's organized crowd, for it was in that age we saw the start of men in the ministry taking an unwarranted leadership over their ministering brethren. (Bishops set up in districts, over elders). But I believe in the supreme authority of the local assembly. Yes. Let each church be its own, choose its pastors, its deacons, its, whatever it is. And then, that way, the man in there has no bishop over him. The Holy Spirit wants to speak something to that church, they don't have to ask anybody about whether they could do this or do that. It's the individual in contact with the Holy Spirit. Show me by the Bible what's greater, in the Bible, than a local elder to a local church? That's right, yes, sir, the sovereignty of the local church, each church in itself. Now, brotherhood, that's wonderful. All churches ought to be in a brotherhood like that, together. But the sovereignty of local church! But let me tell you, the Church of God is led by the Spirit of God. They move as the Spirit moves them. God didn't promise just to move with bishops. Elders is what is the head of the church, every church. 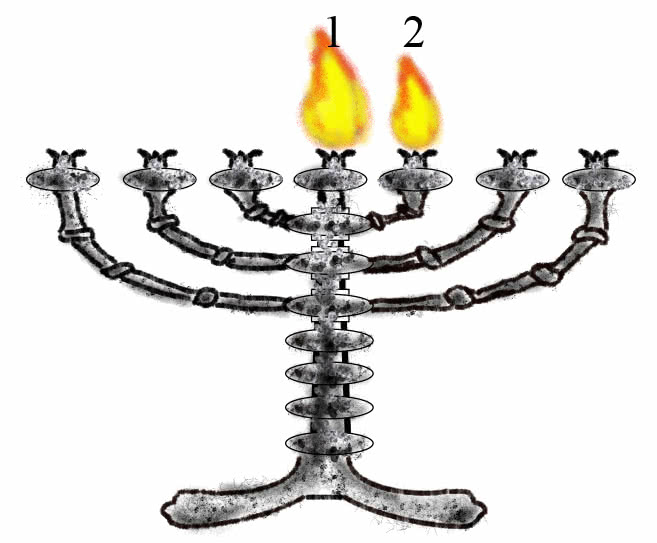 The second church age showed a second candle being lit. But it is moving away from the original. The flame is getting smaller as they are departing from some of the original Scriptures. Each church now had one man who was elevated to being in charge of the church. Pergamos was the third age which saw the Roman emperor Constantine force unscriptural words into church doctrine at the council of Nicaea in 325 AD. This produced the Trinity of three Persons in the godhead ( unscriptural ). Three Persons cannot have one Name so God lost His Name and it was replaced by three titles. Christians say, "In the name of the Father, and of the Son, and of the Holy Ghost", but they cannot tell us what that name is. Ask a Christian, "What is the name of God", and you just get fuzzy waffle. So the third commandment has lost its meaning. No one blasphemes in the name of Father, Son, and Holy Ghost. "Jesus Christ" is the well known and painful blasphemy that Christians regularly hear from sinners. Typical pictures of the Trinity godhead by Trinitarian artists. This is a more modern version. 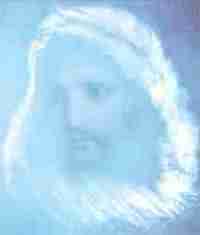 These are the kind of fuzzy pictures that Christians have in their heads when they think of God. No wonder they cannot find one name for their Trinitarian God. Now look at a carving of an ancient pagan trinity from Egypt. The same basic idea. Three persons in one godhead. 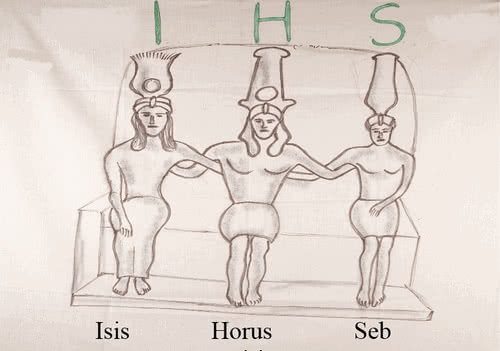 The only difference is that each person had a name, Isis, Horus, and Seb because the Egyptians knew they could not find one name for all three persons. They were more honest. They did not bluff their converts by using three titles and pretending that it was a name. I was educated in a church school where " I H S " was always on a cloth that was draped over the pulpit from which the minister spoke. " I H S " was also inscribed on the altar cloth of Egyptian temples as it was the initials of Isis, Horus, and Seb. The infiltration of paganism into the church began in the third church age. It has since made strong inroads. Why did Islam arise around 630 AD? Because Muhammed could not handle a God who consisted of three Persons. He could not handle a God who thus had no name. So he found one name for God, Allah. The Muslims have a name for their God, the Christians do not have a name for their God. So the Trinity caused the rise of Islam as a backlash against God losing His one Name. Islam is possibly the greatest external religious threat to Christianity. The biggest internal threat to the church is the preachers behind the pulpit who brainwash us with pagan traditions and political opinions. Jesus and Paul lived in the days of evil and corrupt Roman emperors. Yet they did not preach politics except to tell us to pray for the government and pay our taxes. The church became thoroughly married to politics and pagan traditions. The emperor Constantine established the Bishop of Rome as the head of the church in the western Roman empire. This was a further move away from the original church of the apostles. So the flame of truth became even dimmer. Human opinions were replacing Scripture. Human leaders replaced Jesus as the head of the churches. Thyatira was the fourth church age that saw the depth of depravity in the Dark Ages as the Roman church dominated Europe. They had fiddled with unscriptural words and changed the Bible which is the Light of the world. When you fiddle with a light it will go out. EVIL means moving away from the written Word. Moving away from the New Testament church. Adding and removing from the Bible. Accepting human opinions and pagan traditions. Forsaking what the apostles wrote in the New Testament. The flame had got very dim. There was not much of the New Testament truth left in the church. Anything you believe in that is not written in Scripture is just totally wrong. Think of our commonly used expressions that are ubscriptural like, "Merry Christmas", "Trinity", "The pastor is the head of the church", "Easter eggs, Easter rabbits", "Christmas tree", " 25 December", "Women preachers", "Sprinkling children", "Confirmation", "Catechism", "Denomination" and so on. And then we end up not even knowing what the Name of the Father, and of the Son, and of the Holy Ghost is. How far have we moved from the original? This Chapter sees the church start to recover in the Reformation before collapsing at the end. Sardis, the fifth church age, saw Protestants begin to escape from the Roman church as Martin Luther in Germany preached that the just will live by faith. Salvation was by grace through faith, and not by works. What was significant was the change in direction. It was a movement trying to get back towards Scripture rather than moving away from Scripture. The flame was still not very strong. There was still a lot wrong with the church. Martin Luther unwisely got involved in politics and the consequent peasants revolt saw 100 000 people being killed. He had no revelation about how God was dealing with the Jews and ended up condemning them. But thanks to Luther the direction had changed. His incredibly brave stand against the Roman Catholic church that ruled Europe and wanted to kill him was inspirational. People put their faith in a personal relationship with Jesus rather than trusting in obedience to the prescribed works of their church. A flame was starting to burn that could move in the opposite direction and get closer to the original first flame of the day of Pentecost. Philadelphia, the sixth church age, means brotherly love as John Wesley in England preached holiness and outreach. The English king had periodic fits of insanity. The country was in an uproar. They were approaching the same stage of the French who had their famous revolution that got rid of the king but established Napoleon as a military dictator. His 60 battles cost the French about a million dead. Wesley refused to preach politics and insisted that the people focus on salvation, holiness, and outreach. His influence saved England from a revolution and much bloodshed. This also laid the foundation for England to open the great door of the missionary age, which was the golden age of the Reformation. God allowed England, with her powerful navy, to rule about one quarter of the world so that the missionaries and the English language could spread out over the globe. The King James Bible from 1611 was written by 47 scholars from the Shakespearean era when human scholarship and literature was blessed by the Man beast which is around the throne of God. This Bible had been thoroughly checked by 1750 as an accurate word-for-word translation of the original manuscripts. This Bible was the backbone of the missionary age that started about 1792 when shoemaker William Carey went to India. No book has had a bigger influence on mankind than the King James Bible. As a result Satan hates the King James Bible and encourages people to endlessly criticize it and try to "modernize" it. Please do not fall into that trap. It is the best Bible and despite all opposition it remains a best seller as billions of copies have been sold over the last 400 years. A big rival of the King James Bible today is the New International Version ( NIV ) that was published in 1978 and had made 36 000 changes from the King James Version Bible. That was still not enough so it was then further modified in 1984 to become a favourite of evangelicals. This 1984 version of the NIV was then again modified in 2005 and called Today's NIV, or the TNIV. This new translation was made so as to become more gender neutral. References to "man" tended to become "persons". But female references were unchanged. An obvious bias. But once changes start, there is no end to the process. Then another update was made in 2011 and the favourite 1984 version went out of print. Evangelicals were horrified. Four different versions in 33 years. Does God keep changing His Mind? Watch this space for the next version of the NIV. God's ancient Word cannot be changed to fit in with today's temporary obsession with gender equality. We cannot change God to think our way. We must change our ways to think like God. Laodicea is the end time seventh church age that ends in spiritual disaster. Wealthy and complacently comfortable, but also blind, miserable, naked, and wretched but they do not know it. The lukewarm church becomes vomit in God’s mouth. Wealth becomes the measure of success. Jesus, the Word, is rejected by the church and stands outside, appealing to any individual who wants to listen to Him. A small Bride of individuals will be restored to the New Testament faith. The age began well in 1804 with the Welsh revival and the 1806 outpouring of the Holy Spirit in the Azusa street revival in Los Angeles, America. But this revival only lasted four years and by 1917 Pentecost has become an organized denomination instead of a movement of the Spirit. LIVE is just written in the opposite direction to EVIL. Moving towards the original Spirit of the first church age. Then Pentecost subsided in the 1920s until it revived again in the late 1940s. In terms of spiritual power they were a great movement. They certainly brought the baptism of the Spirit and the gifts of the Spirit back into the church. The supernatural manifestation of the Spirit was not the full story. The church also had to return to the full truth that the early church had. This was the ministry of the angel or messenger to seventh church age. William Branham in America unfolded the hidden mysteries of Scripture so that we could believe what the early church believed. John the Baptist had the spirit of Elias to begin the Gospel and introduce Jesus. He never restored anything. He introduced a brand new baptism of repentance. But he had been killed. In this verse Jesus points to another prophet who is to come and restore the end time church back to the first church age. Only when the full truth is known will we be fully restored back to what the early church believed. But message preachers began to interpret brother Branham’s quotes to mean doctrines that are not written in the Bible. Doctrines that the early church never believed. They began to invent doctrines where there is no written Scripture like the seven Thunders, the new name of Jesus, and the Coming of the Lord. 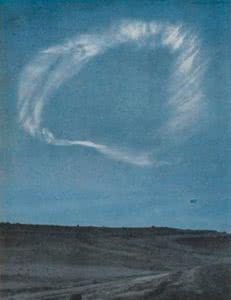 A supernatural Cloud was photographed north of Flagstaff on 28 February 1963 travelling horizontally at an altitude of 43 kilometers. A second cloud was also seen 20 miles behind it that was formed by the smoke of an exploded boosted-up Thor rocket from Vandenberg Airforce Base in California. 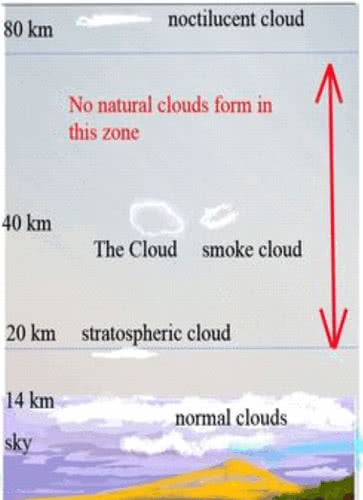 Natural clouds do not form between 20 and 80 kilometers of altitude. 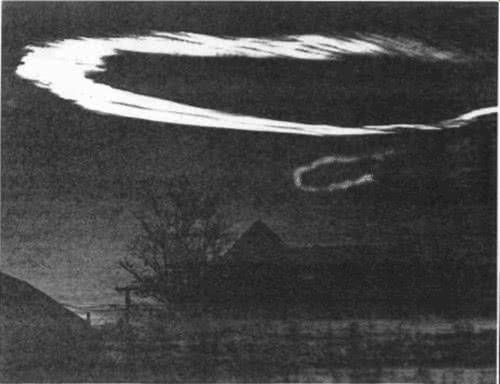 This photograph that was taken from Winslow shows the two clouds. The smaller smoke cloud is at the back, behind the bigger supernatural Cloud. The two clouds moved from the west over Flagstaff to the east. The second ( smoke ) cloud was only visible in photographs taken from Winslow as both clouds were moving towards Winslow. 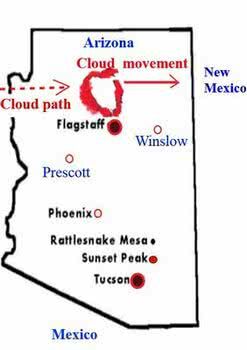 Photographs from Tucson, Phoenix, and Prescott were side views that just focused on the front much-bigger Cloud that was formed from angel's wings as there were no aircraft or rocket exhaust fumes to produce contrails ( condensation trails ) that could form a cloud at that height. Aircraft and rocket fuel forms water vapour in the exhaust gas. Eight days later and 200 miles south near Sunset Peak and Rattlesnake Mesa, seven angels came to brother Branham to commission him to reveal the seven Seals. Brother Branham, who knew nothing about the supernatural Cloud when it was photographed, made the mistake of thinking that it was formed by the seven angels when they left him on 8 March at Sunset Peak. The angels had actually formed the Cloud eight days earlier. They formed no Cloud when they left him. Unfortunately message believers did not check the facts and fanaticism overlooks facts. Message pastors claimed that “The Cloud” was the Coming of the Lord. It announced that Mercy was over. Jesus had come. Then it also became the coming down of the mighty Angel of Revelation Chapter 10. It was also something to do with the seven Thunders of Revelation Chapter 10. Human speculations know no limits. There is always some sucker who will fall for anything. There was no face in the Cloud. A Photostat of the Cloud taken from the Life magazine back cover showed some features of a face. The original photograph of the Cloud taken from the Tucson observatory has no face. This face appeared when brother Pearry Green made a Photostat of the original photo. Some message believers then painted a face inside the picture of the Cloud. Many message people now believe that the face was actually visible in the Cloud. So error spreads. Notice that the original photo has to be turned through ninety degrees to make the face upright. Message pastors also claimed that the seven Seals had been actually opened, not just revealed. The Seals only open once the Lamb steps off the mercy seat so they also claimed that mercy was over in 1963, except for the Bride. ( Whatever that means, because it is totally unscriptural ). The book of sermons on the seven Seals makes it clear that brother Branham was given the revelation of the seven Seals. It was as though he was standing there watching them open. That is what a prophet means. God takes him beyond the curtain of time to watch the event before it finally happens in the future. Then the prophet can return and tell us exactly what is to happen. God never does anything unless He first reveals it. No-one in the history of the church has ever revealed the seven Seals properly. Brother Branham was the first to do so. The actual Seals will open when the Bride is in Heaven after being caught up to meet the Lord in the air. :16 So then because thou art lukewarm, and neither cold nor hot, I will spue thee out of my mouth. This is a dark age of denial. No church believes that this awful condemnation applies to them. Only individuals that are in the church can hear Jesus calling. They have to have courage to disagree with the church leaders. They have to have enough insight to realize that religious deception comes from the pulpit of their own church. The church would never be in this condition if Bible truth was preached from the pulpits. Each church has some things right, but also has a lot wrong. The Laodicean church is called upon to repent zealously. So there are many errors that need correcting. Yet each Laodicean church of today feels self-righteously complacent that it alone possesses the full truth. Each church fondly imagines that they have it all and thus have need of nothing. They feel that they certainly have no need of correction. In the modern age of competitive Christianity, each church feels that they are better than the others. A sad drama of saved Christians heading for the Tribulation because they thought that contradicting the Bible, ignoring certain Scriptures as being unimportant or irrelevant, and being Bible illiterate was not an issue. This is the only age that has ejected Jesus, the Word of God, from the church. The twisted up quotes which message people rely on have no Bible foundation. They cannot be followed from Scripture to Scripture in the Bible. The seven Thunders were not written in the Bible. Yet message pastors make a major doctrine out of the Thunders. There are so many variations and different versions of the seven Thunders, that the “message” as such has splintered like a broken mirror. Christ, the Word of God, is outside the church. He does not even appeal to the whole church. People love their church more than they love the Bible. Popularity, acceptance, and security are their main aims. Jesus only appeals to an individual. The pastor claims to be head of the church. A body cannot have two heads. So Jesus, the true Head, has to stand outside. The ultimate irony. The word “pastor” is mentioned once in the New Testament and somehow he has usurped Christ’s position as Head of the church. The pastor stands as head “in place of the Son of God”. In Latin this is VICARIVS FILII DEI. Some Latin letters have a number value. This adds up to 666. The mark of the beast. When carving capital letters the Romans used a V to stand for a U as straight lines are easier to carve. How the Protestant churches have faithfully copied the example of the mother Catholic church as we are fooled into immitating the mark of the beast. After this. After what? After the seven church ages are complete. John is caught up to Heaven at the end of the church ages to symbolize the catching up of the church. A trumpet calls him up through the Door to Heaven. Jesus is the Door to Heaven. Since 2017 Trump has become well known as president of America. Is God using this man as a sign of the times ( the trumpet ) because he is restoring Jerusalem back to being the capital of Israel? John is going to be shown things that happen hereafter, after the church is called up. :4 And round about the throne were four and twenty seats: and upon the seats I saw four and twenty elders sitting, clothed in white raiment; and they had on their heads crowns of gold. One God sits on a throne with the Book of Redemption in His hand. Twenty four elders, 12 Patriarchs from the Old Testament and 12 Apostles from the New Testament, sit around the throne showing that the church is resurrected and in Heaven, and are now around the throne of God. Jesus alone can take the Book of Redemption and open it. So Jesus is the only One Who can save us as well as being the only One Who can open our eyes and make us understand the Bible. :5 And one of the elders saith unto me, Weep not: behold, the Lion of the tribe of Juda, the Root of David, hath prevailed to open the book, and to loose the seven seals thereof. Jesus is the central focus in Heaven. He alone can handle the Book of Redemption, the Bible. He alone can open the Book and reveal the plan of salvation down through the 2 000 years of church history. He alone could purchase the salvation that He freely offers by grace. This is a mystery Chapter. 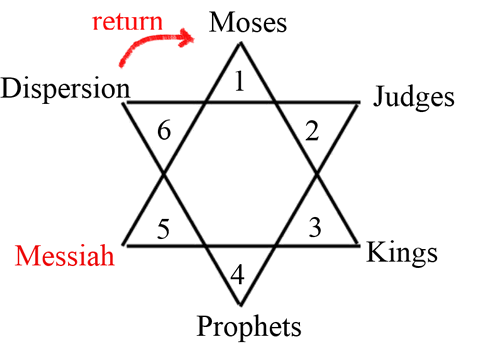 Jesus actually opens the Book of Redemption which is sealed with seven Seals. But we need to know many of those mysteries in order to be ready for the Coming of the Lord. So God took the seventh messenger, in the last or seventh church age, and took him beyond the curtain of time so that he could see this event acted out as though he actually was there. This gave him a revelation of the seven Seals. He was able to tell us about six of the Seals, but the seventh is a total mystery as it refers to the Coming of the Lord. That is why the seventh Seal is separated from the first six Seals. It is not mentioned in this Chapter 6 as it is totally unknown. The revelation of the Seals by the end time prophet is the same as the actual breaking open of the Seals after the church is in heaven, in terms of the information about these mysteries that was given to the seventh angel. He saw this event in the future and then came back to tell us about it. So it is just as though the Seals have opened. God first reveals the opening of the Seals before He actually opens them after the Rapture in Chapter 6. 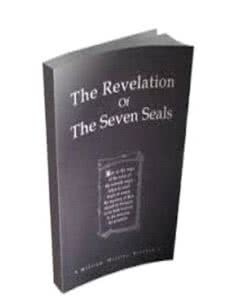 The book of sermons where he preached on the seven Seals is called “The Revelation of the Seven Seals”. The Seals have opened in a preview, in a revelation of the future event that will happen when the Bride is in Heaven. Do not make the mistake of thinking that the "revelation of the event" is the "actual event". But there is one big difference between a revelation and the actual event. When the seven Seals actually are broken open, after the true church is in Heaven, then all the mysteries will be made known in great detail. But the preview of this event, which is just a revelation of the opening of the Seals, allows God to withhold certain information. So what do we not know about the seven Seals? We know nothing about the "seventh Seal" which is the Coming of the Lord. The Seventh Seal hasn't opened yet, you know. That's His Coming. We know that the sixth Seal represents the great Tribulation. That Seal will only be opened by the two prophets Moses and Elijah who can do what they like with nature. Thus we, in comparison, have only a rough outline of the Tribulation but we actually know very little about it. The Jewish prophets will know all the details. They will know far more than us. And now here's these two prophets standing here with the Word of God to do anything to nature they want to, and they shake the earth. And it shows exactly who does it. It's Moses and Elijah, 'cause there's their ministry re-impersonated again: both men. Oh, my. Do you see it now? See what the Sixth Seal is? It's those prophets. Now, notice. Don't let it choke you, but watch what opened that Seal: prophets. See? Amen. There you are. Oh, we're living in the eagle day, brother, head up among the clouds. They opened that Sixth Seal. They have power to do it. Amen. There's your Sixth Seal coming open. See? Since it is the two prophets who open the sixth Seal, the church does not know too much about the Tribulation time. We can talk about nature being interrupted in theory from the comfort of our armchairs but they will be "down and dirty" in the trenches on the front lines of Israel in great danger as they actually produce the supernatural goods that we can only talk about. The fifth Seal deals with the persecuted Jews down through the church ages. They form a different side of the pyramid shown below. The Holocaust when 6 million Jews died was their worst persecution. It was a preview of the great Tribulation. In that sense it was an amateur Tribulation despite all it horror. So the great tribulation will be far worse. The gap between the six Seals in Chapter 6 and the seventh Seal in Chapter 8 represents the mystery surrounding the Coming of the Lord . The seventh Seal or Capstone is the Coming of the Lord. But this Seal moves on to mention the 144 000 Jews who are killed at the end of the Tribulation. We know the past history of the Jews but cannot follow this fifth Seal when it goes into the Tribulation as God has told us nothing about His Coming and has also told us very little about the great Tribulation. The Bride escapes from the Tribulation so it is not really our business to delve into all those facts and figures. ISAIAH 57:1 …….none considering that the righteous is taken away from the evil to come. Fortunately the true church will not have to go through the great Tribulation. 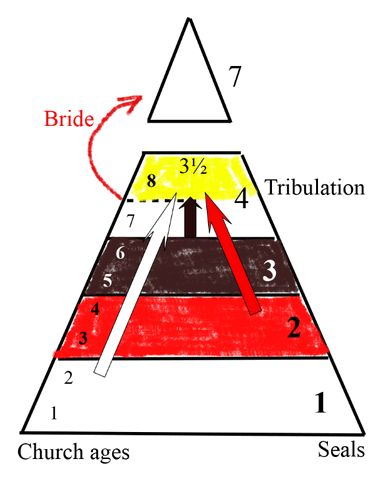 The Bride goes to Heaven half way through the fourth Seal ( shown by the red arrow ). The fourth Seal has not been fully revealed as we do not know who the antichrist horse rider is, the final Pope. He is called Death. Death can only enter when Life leaves. So only after the Holy Spirit has taken the church up to Heaven will the final Pope be revealed. Death and hell follow him so we can only guess at what that means, as we do not have precise information on those issues that occur in the Tribulation. So the second half of the fourth Seal is for the foolish virgins in the Tribulation. This is part of the sixth Seal which is the Tribulation. That is why the two yellow portions are at the same level on the above diagram. The pale horse that the Devil of Death rides is a mixture of the three previous horse colours. So we are in the uniting time of all the past evil. The first seven verses of Chapter 6 coincide with the seven church ages. The eighth verse ( 8 represents a new system ) is the Tribulation that lasts for three and a half years. The first seal has a white horse or power that represents religious deception which continues to ride on through every church age right into the Tribulation. So be careful what you listen to. Deception is alive and well behind the pulpits today. But the Devil has learned much during church history and his lies are cleverer today than at any time in the past. The pulpit is the last place that you would expect it. That is why it is so deceitful. You spend more time listening to pastors than to anyone else. So take heed. Check in your Bible. The first half of the fourth seal ( verse 7, which coincides with the seventh church age ) represents the uniting of religious deception from all seven ages. So the modern errors are very clever. You only know that they are wrong when you find that you cannot follow them through different Bible verses. That is your only defence. Pastors will shower you with quotes. Then ask them to take the revelation that they have from the spliced-together quotes and prove the idea just by using their Bible. They cannot. In addition, this religious deception is uniting with the red political influences. Politics always has one man in charge. Then they merge with money power. Church leaders are making good money out of the Gospel. Both at the beginning and the ending of His ministry, Jesus chased out the "money makers" from the temple. They had made a lot of money out of the people’s beliefs. Times have not changed. Church is still a good business. That is why it is handed down from father to son. It is now a family business. The white horse of religious deception as the bowman has no arrow. But Pope Nicholas I received a crown around 860 AD. The red horse of political power saw the Pope claim the right to crown the leader of the barbarian tribes in Europe as a king. By 1200 Pope Innocent III was claiming supremacy over all of Europe's kings. The black horse of demonology rode out to oppose the Reformation that started in 1520 under Martin Luther because he was calling the people back to the Bible. The Roman church, by contradicting Scripture, simply ensured that the people were starving for truth. Chapter 6 ends with the sixth Seal which talks about the Tribulation. Chapter 7 tells us that the function of the Tribulation is to pull out the 144 000 Jews as well as shaking up the vast number of complacent foolish virgins who were saved before the Tribulation started but were blinded by their denominational churches. They were too complacently relaxed in the supposed safety of regular church attendance, so they ignored everyone outside their church who tried to help them and thus could not find the full truth of Scripture. In the horror of the great Tribulation they will quickly lose their love of church membership as well as their love of their church leader. No-one loves a person who blinds them and deceives them. For the rest of eternity all these numberless saved but foolishly Bible illiterate people will be second class citizens in Heaven. If elders had been in charge of the church they could have opened the door to teachers who could have taught them the truth just from the written Word. Then they could have been part of the Bride. This starts with the seventh Seal. This is the greatest mystery in the Bible as it deals with the second Coming of Jesus which we do not understand. You cannot interpret "silence" as you have no clues to go on. God wants to keep His Coming a mystery. Pastors who claim to know the seventh Seal are just deceiving you. They are desperately trying to be clever. You will be better off if you ask them to be silent on this topic. The structure that is in the previous diagram reminds us of a pyramid that is waiting for its Capstone. The Capstone is the Coming of the Lord. There is a great mystery that veils God from our human eyes. This is represented by the gap between the pyramid and the Capstone. However much we know, this gap represents a mystery that we do not know. A gap in our knowledge. Chapter 8 reveals the first four Trumpets that sound in the Tribulation in order to force the Jews back to Israel. These seven Trumpets do not sound in the church ages as they are not Gospel Trumpets, they are simply a time of judgement. There is no mercy in these Trumpets. The Gospel trumpet always offers mercy and a warning before judgement. The first Trumpet has hail and fire, just as happened to Egypt before Moses led the first exodus from Egypt to Israel. This will tell the Jews world-wide that they need to get back to Israel. The seven Trumpets are unique as they are judgement Trumpets. Normally a Gospel trumpet announced a spiritual war when a messenger brought his message. Then when the church rejected the revealed truth, God would pour out a temporary plague of judgement. The Gospel, like Jonah, always offered mercy first, and then judgement only followed when mercy was rejected. God does not allow the church to judge people. Humans are thus not allowed to blow judgement Trumpets. Humans are not allowed to judge. But the seven Trumpets only offered judgement. This is the Tribulation time when God is pouring out His wrath on the world. These have to be heavenly angels who are trusted with this harsh task. There is also a pattern with the church ages. Chapter 2 had the first four church ages. Chapter 8 has the first four Trumpets of judgement. The fifth trumpet has the opening of the pit of hell and a demonic horde pours out to control and terrorize the world, symbolized by destructive locusts. These are religious demons. They have a crowned king over them. Soon after 1300 the Pope was wearing a triple crown that he continued to wear until 1963. 1963 was the year that the seven Seals were revealed. This amazing light struck the kingdom of darkness. The Pope died that year and the only Roman Catholic president of America John Kennedy was killed. Even the new Pope, Paul 6, saw something wrong with the triple crown because after his coronation he took it off and refused to wear it. So some light also got through to the Catholic system. Then the sixth Trumpet produces bigger and stronger demons represented by horsemen, all 200 million of them. The Euphrates river was mentioned as running out of Eden and it also formed the border of the Promised Land. So these are religious demons. They are the worst kind. Chapter 10 forms a gap between the first six Trumpets and the seventh Trumpet. Two trumpets for calling an assembly represent Moses and Elijah in the Tribulation who call the Jews to make their journey back to Israel from wherever they are in the world. The Jews will get these two Gospel Trumpets. The rest of the world will be getting judgement Trumpets. The judgement Trumpets that sound in the Tribulation will force those Jews to return who were reluctant to do so. The Tribulation is a time of endless judgement. So how are the Jews to survive? They are going to have to know a lot more than we know about the Tribulation events. William Branham came so that his message could reveal the Scripture to us Gentiles as he slowly opened our understanding of the Bible. He began in 1933 and gradually God opened his eyes to the mysteries of the written Word. Thirty two years later God took him off the scene in 1965. By then he had left enough books and sermons so that in the days of his voice on tapes, MP3, internet, and books we could learn the mysteries of Scripture that we need to know in order to be ready for the Coming of the Lord. Fifty years after his death we are still trying to learn how to use his quotes to interpret Scripture. Most message people lost the plot by simply parroting quotes without establishing them in the Bible. Message pastors claimed Hillary would become president of America in the 2016 election. She lost, showing how far message pastors are out of contact with God’s thinking. But the two prophets to Israel only have three and a half years to pull out the 144 000 Jews. So they do not have time to learn how to open the Book and understand its mysteries. That has already been done for them by William Branham who explained the mysteries with the exception of the Tribulation mysteries that do not apply to the Bride, who will be in Heaven at that time. This mighty Angel does not at all look like the Cloud. There was no face in the original Cloud photograph. Faint shadows in the Photostat indicated a face. But the Angel had a face like the sun. Dazzlingly bright. The 1963 Cloud had no body, just a head. This Angel had a cloud to cover His Body. His feet were two bright pillars of fire. There were no feet in the 1963 Cloud. There are not two pillars of fire that are visible. The Angel came down. This Cloud was only visible for about 28 minutes just after sunset. It never came down. It drifted from the west to the east as it remained at an altitude of 43 kilometers. This Cloud was photographed north of Flagstaff. Brother Branham was completely unaware of it. He was 200 miles south in Tucson at that time. There was no spiritual person at Flagstaff that the Cloud could come down to. To claim that the 1963 Cloud fulfilled this verse is thus completely wrong. So in Chapter 10 Jesus comes down as the Archangel to raise the dead from land and sea. Coming down as an Angel is not a “Coming of the Lord” when He comes down in a Human Body. But, remember, if it goes plumb into the shadows of death, "I am the resurrection and Life; I'll raise him up again." And when the great Director comes down and bears that stick down, then, "time shall be no more." When that Angel, of Revelation the 10th chapter, puts one foot on land and one on the sea, and a rainbow over His head, He swore, "time shall be no more." When that time comes, you'll rise up from among the dead. While the rest of them lay there, you'll go in. This is 1964 which is about a year after the Cloud of 1963 and after the Seals were revealed. He speaks of the Angel in the future tense. This is not the resurrection of Lazarus. This is when you will raise from the dead, should you have died before the Lord comes. This is when time is no more for the Bride as they step out of time into eternity. This is the end of the seventh church age when time ceases for the Bride because their bodies are changed into immortal bodies that time has no influence over. You will never change or grow older. All the dead from the church ages are either buried on land or at sea. Christ, as the archangel Michael, comes to claim them in the resurreaction. The shout is the message of the seventh angel to prepare the Bride for the second Coming. This is the voice of the archangel that will raise the dead. Both statements in REVELATION 10: 3 refer to resurrections. We live in a space of three dimensions which are length, breadth, and height. We also find that we are prisoners of time which is the fourth dimension. We are helpless as we drift from the past to the future in the pipeline of time which surrounds us. The only way to get out of time on planet earth is to receive a new immortal body. Time makes us change as we age. Time only allows us to grow, with many difficulties as our strength exceeds our wisdom, until we are about 25 years old. After that it is downhill as our bodily strength fades because time is affected by the laws of decay. Then we have to die which is an unpleasant episode in our life time. :17 Then we which are alive and remain shall be caught up together with them in the clouds, to meet the Lord in the air: and so shall we ever be with the Lord. After the resurrection of the dead, our bodies have to change so that we can be caught up with the resurrected saints. :52 In a moment, in the twinkling of an eye, at the last trump: for the trumpet shall sound, and the dead shall be raised incorruptible, and we shall be changed. This is shown by the blue arrow in the above diagram. Heaven is shown separated from earth and time. Heaven is outside of time as there is no time in Heaven. What does this mean? That is when the Bride goes to Heaven where they are not subject to time and its laws of decay. When there is no time then nothing deteriorates. There is no sickness as that is a product of decay. There is no death because when there is no time, nothing ends. There is no sin because death entered with sin. And death produced a life span for people because they had to deteriorate and die. So when Lucifer in Heaven sinned, there was already a three dimensional earth and universe, so God had to create a fourth dimension of time for him to inhabit. Lucifer was changed to Satan and needed a spiritual dimension to live in. God put him and his bottomless pit of hell into the dimension of time because one day he will be consumed in the Lake of Fire. Satan will only exist for a certain time. Moments were always ticking by in Heaven in terms of things happening but there were no negative effects until Lucifer sinned in Heaven. Time started when the negative effects of Satan started. Satan introduced disorder. Time as such is the flow of disorder. Increasing disorder gives a direction to what we call time. So God bound up Satan and his ability to make things decay and die and placed them into a separate spiritual and invisible dimension called time. Satan, the spirit of good-and-evil was symbolized by the tree of the knowledge of good-and-evil in Eden. God changed Lucifer into the Devil and had to find a home for him so He created the dimension of time to contain the “good and evil” of the demonic world. 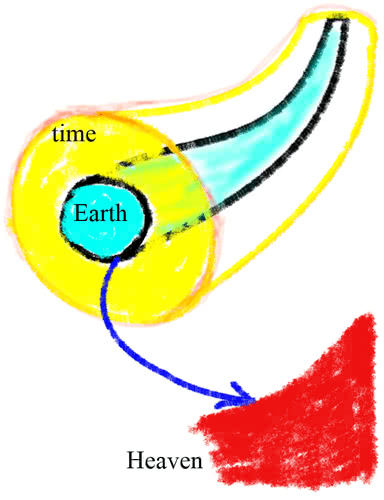 Sin thus produced the dimension of time which includes the bottomless pit that held spirits that could produce both good ( making them deceptive ) and evil ( making them harmful ). Adam was created outside of time and was unaffected by this fourth dimension of time and good-and-evil spirits. When he sinned, the three dimensional earth also became trapped in the fourth dimension of time. Sin-cursed earth will only be around for a certain time. Satan brought these spiritual influences down from the higher time dimension to unleash death, hell, and the grave on planet earth when Eve opened the door for them to come in. The spirits of dead men also enter the fourth dimension of good-and-evil to wait for judgement day. They rely on their good deeds. But their sins were evil. “Good and evil” as a mixture is doomed because all the good in this spiritual fourth dimension has poisonous roots. Drugs make people feel good for a while on a "high" but they are also chemical claws that tear at their brains. Eternal Life is the Holy Spirit. He is just good. In their new bodies the Bride gets away from the fourth dimension of time and can no longer be harmed by its evil influences. So when time ends for you, sin loses all its hold over you too. All the spiritual inhabitants of the fourth dimension end up in the Lake of Fire. Time still continues until they are totally consumed and disappear. When Satan is finally consumed that will be the end of the fourth dimension. It will have no further ill effects on anyone. Then time as such will end because time was the dimension that contained all the evil that caused the friction and disorder. Only in their new bodies can the Bride live outside of time. They do not age or decay in any way as our present bodies do. For them, there will be time no longer. But the rest of the world carries on in time. A three and a half year Tribulation followed by a 1 000 years of peace. Then Judgement Day. The foolish virgins, being saved, receive glorified bodies and step out of time. Those condemned to the Lake of Fire serve out their sentence and then cease to exist. That is when time ends for them. There is time no longer for the Bride in their glorified bodies. Moments will still tick by but will have no negative effects on them as their old nature will be dead and the Holy Spirit will flow through their veins and be in full control of them. Then the evil that is in the dimension of time will be totally unable to harm them or influence them. They will live without sin like Adam was at the beginning. But there is a difference. Eve knew nothing about sin but her curious human nature made her want to investigate sin. God has thrown us into a world of sin that is sickening and scary. So when we are in Heaven we will have absolutely no interest in sin or curiosity about sin because we have seen its awful consequences. Should we ever forget, the scars in the Hands of Jesus will quickly remind us. Our sins did that to Him. So we will have no pride in Heaven, just gratitude. When there is time no longer, the Bride will be able to live completely without sin. A crucial fact : The mighty Angel does not come down to open the Book. The mighty Angel comes down because the Book has already been opened, the mystery of God has already been finished. But, this One didn't come from the earth. He come down from Heaven, because the mystery is all finished. And when the mystery is finished, the Angel said, "Time shall be no more," and Seven Thunders throwed their voices out. What if it is something to let us know how to enter into the Rapturing Faith? Is it? Will we run, leap over walls? And is there something fixing to happen, and these old, marred, vile bodies are going to be changed? The mighty Angel only comes down when the mystery is finished, fully revealed. When the First Seal was opened, the Seals that was inside the Book, these mysteries that was sounded forth: justification, sanctification, Roman Catholic church, Protestants! And when all their little battles and things left these loose ends in the Word of God, the seventh angel comes on and gathers them all up and explains them. See? And then, he finishes, Seven Thunders utter out. The mystery of the seven Thunders is not part of the mystery of the written Word that is to be revealed by the seventh angel. The Word comes. "The Book that is written within," is then completed when this, all these mysteries have finished to be sounded. Brother Branham came to reveal the mysteries that are written in the Bible, not the unwritten mysteries like the seven Thunders, the new Name of Jesus, and the Coming of the Lord. We know nothing about those mysteries. Notice Revelations 5:1. Listen at this now. And I saw in the right hand of him that sat upon the throne a book written within (the writing was withinside) and on the backside, sealed with seven seals. 303 Now, there is writing on the inside of the Book. But, the backside had Seven Seals, on the back of It, that wasn't written in the Book. Now, this is the revelator talking, John. Now, remember, It wasn't written in the Book. "And in the days of the voice of the seventh angel, all this mystery that's written within should be finished." It should be taken care of, in that day. …….. "And at the time that the seventh angel is sounding, all the mysteries that are written in the Book is completed." The completed mysteries that the seventh angel revealed are symbolized by the open Book that the mighty Angel held in His hand. Brother Branham finished preaching the mysteries in December 1965. Only then could it be claimed that the Book was open because its mysteries were revealed. The Angel could not come down before that. If you cannot explain why Jesus wrote twice in the ground with His finger then the Book has not opened for you. The seventh angel came to give us the revelation of the mystery of Scripture that would prepare us for the second Coming. When that revelation was complete ( which finished in December 1965 ) then only after that could the Angel come down with an open Book. Before December 1965 there were still hidden mysteries that had to be revealed, which meant that the Book was not yet open. The Angel only comes down because the mystery is finished. Then time ends and seven thunders utter their voices. Oh, not many in number, but what a powerful group that's got Eternal Life! Said, "They shall run through a troop and leap over a wall." Yes, the "troop" of death will have no holders to it, She'll run right through it. Leap over the "wall" between natural and Supernatural, and go into the arms of God, into that great Eternity. Lord God, we thank You for this. We know the time is approaching at hand. The Bride is not many in number. The wall of time separates us from the supernatural. When the dead raise up, they and the living Bride will run through the troops of death and demons that can no longer stop them as they leap over the wall of time and get caught up into eternity. II SAMUEL 22:30 For by thee I have run through a troop: by my God have I leaped over a wall. Is that really them Seven Thunders, fixing to utter out something, that the little group that is gathered together will receive a Rapturing Faith, to go in the Rapture when He comes? "For we'll be changed," as quick as those Angels come, "in a moment, in a twinkling of an eye; and shall be caught up together with those that had sleep, to meet the Lord in the air." The seven Thunders utter at the time that our bodies change. With our present sinful bodies we could never be caught up to meet the Lord in the air ( or “raptured” as the churches say ). Then seven Thunders utter at the time when the living Bride have their bodies changed in order to give them faith to be caught up into the air to meet Jesus. Walking upwards into the air cannot be done in this body. You will need a new body to achieve that. This catching up, when it happens, will thus be a complete defiance of the laws of nature. So at the same time the seven Thunders utter to the two prophets to give them complete power over nature so that they can defy the laws of nature and use “nature going chaotic” as a weapon to protect the Jews. In 2018 Turkey sent modern tanks into Syria to take over some territory in the northern region of Afrin. In the tribulation, when the antichrist sends hordes of tanks against Israel then Moses calls for an earthquake that swallows up the tanks like Korah and Dathan got swallowed up. :32 And the earth opened her mouth, and swallowed them up, and their houses, and all the men that appertained unto Korah, and all their goods. :33 They, and all that appertained to them, went down alive into the pit, and the earth closed upon them: and they perished from among the congregation. If Russia sends in hundreds of jet aircraft to attack Israel, Moses just fills the sky with flies or locusts that clog up the jet engines until the planes crash. The antichrist Roman church system must be destroyed by God’s Sword, His Word in the mouth of His two prophets, because the Roman church used the political power, which is symbolized as the sword of the local kings, to have tens of millions of Christians killed because they opposed the Roman church. Now, we had him coming last night with his great sword to kill. We find out that he gets killed with the Sword too, the sword of the Word. God's Word, sharp, two-edged sword slays him, puts him right down. Wait till them seven thunders utter their voices to that group who really can take the Word of God and hand it there. It'll slice and cut. And they can close the heavens; they can shut this or do that, whatever they want to. Glory. The seven Thunders can only utter right at the end as the Bride leaves and the two prophets start their ministry to the Jews, because the seven Thunders utter to both Jews and Gentiles. They are an exceedingly mysterious set of events that we know nothing about . But once they begin to utter, if we know the Bible well enough, we should be able to pick up the Scriptural clues so that we can be guided by them. "When will it be, Brother Branham?" I cannot tell you. I do not know. But one of these days, if we never meet again on this earth, we're going to meet yonder at the--at the judgment seat of Christ. And you'll find out that in that room, the revelation coming from God (just like all the rest of them has), that them... One of the mystery of that Seal, the reason it wasn't revealed, it was seven thunders that uttered their voices, and there it is perfectly, because nothing knows anything about it; wasn't even written. The seven Thunders were in the future. “When will it be?” The Cloud was photographed a month before this. So the Cloud was not the Thunders. We all know nothing about the seven Thunders. Whatever you think the seven Thunders are, you are wrong. You are just fooling yourself and others. The Bride hasn't had a revival yet. See? There's been no revival there, no manifestation of God to stir the Bride yet. See? We're looking for it. It will take those seven unknown thunders back there to wake her up again. He will send it. He promised it. Now, now, watch. Now, she was dead. The Bride is basically dead until the seven Thunders utter in the future. :6 And at midnight there was a cry made, Behold, the bridegroom cometh; go ye out to meet him. The midnight cry is the seven Thunders which will be such a calamitous set of events that it will wake up everyone in the church systems, Bride and foolish virgins. A woman is a church. All the virgins ( clean churches ), both wise and foolish, were fast asleep. That is the present state of all the churches, both message and denominational. Lulled to sleep by their pastors who all claim to be right and keep telling the people that if they just come to church every Sunday and believe whatever the pastor says then they will be fine. Rock-a-bye baby. Complacently asleep in their safety zone. All the churches say,“We are the Bride”. Despite the fact that there are 45 000 different types of message and denominational churches. There is no desperation in any of these churches to search the Bible for truth in order to escape the impending Tribulation. There is no fear that their pastors are deceiving them. They refuse to even consider that possibility. PHILIPPIANS 2:12 …….. work out your own salvation with fear and trembling. No church offers this advice to individuals. Christians cannot believe that Jesus stands outside every church in the Laodicean church age. But the Bible mentions no exceptions. Thus the church, the zone of safety, is the trap of “Bible ignorance” as no church proves all its doctrine from the Bible. No pastor can explain all the Scriptures so they dismiss as irrelevant all the Scriptures that they cannot explain. Each pastor claims to offer a complete package. “Just listen to me and you will know everything you need to know”. Every church has certain Bible doctrines but also had other doctrines that are simply based on human quotes and traditions, the sayings of some important man. On Judgement Day there will be no important man, only the written Word of God. Today’s Bible-illiterate Christians will not impress anyone on that Day. The mighty Archangel also has an open Book in His hand to give to the two prophets, so that they can immediately learn the revealed mysteries of Scripture. If you notice that's Christ (See? ), 'cause He in the Old Testament was called the Angel of the Covenant, and He's directly coming to the Jews now, for the Church is finished. See? All right. You remember that Angel in Revelations 1? Same thing. Angel is a messenger, and He's a Messenger to Israel. See? The Church has been raptured. See? Now, or fixing to be raptured. He comes for His Church. Notice the double mission of the Angel of Revelation Chapter 10. He comes for the church which is fixing to be raptured and then the church goes in an instant. 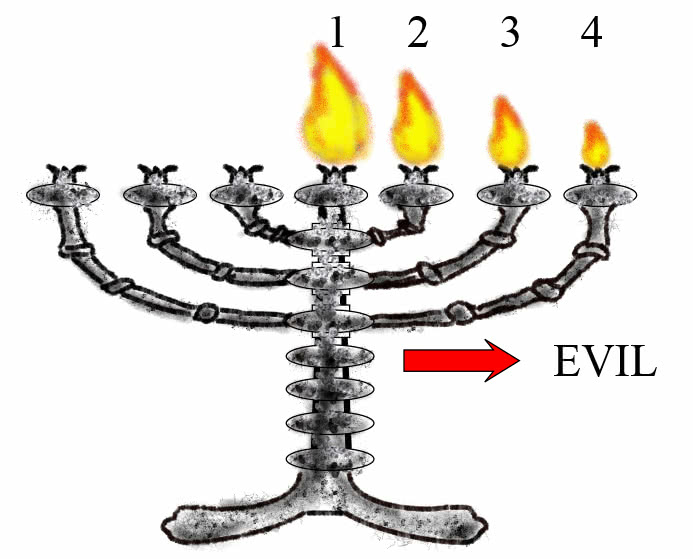 The Angel also comes directly to the Jews because as soon as the church goes He turns to the Jews. But who opened the Book to get a revelation of the mystery of God, Who is the Word? This word “but” changes the whole flow of the chapter. If I say that, “ I like you, but….” Then you know that the theme is going to change. 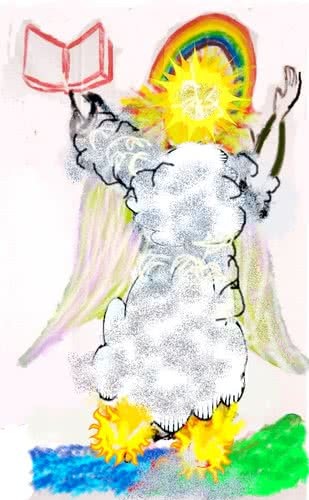 So Revelation 10: 7 changes the focus from the mighty Archangel’s voice calling up the resurrection and the Thunders that open the door to the Coming of the Lord by equipping the Bride to move up into the air, as well as equipping the two prophets to interrupt nature. The Archangel must hand over the opened Book to the two prophets BUT explains that the Book was actually opened years before by the revelations that were preached during the days of the ministry of the seventh angel. The mystery of Scripture should be finished. There is an element of doubt here. Looking into the future John saw the message pastors messing up by interpreting quotes to suit their own opinions instead of using the quotes to understand the Bible. Message leaders should have got it right but it seems unlikely. The apostle John, as a prophet, could digest the opened Book. It was bitter in terms of the opposition to truth that he had to endure but sweet in his mouth as he testified of God’s deliverance through all his difficulties. The two Jewish prophets will face untold bitter difficulties in the Tribulation as the nations and kings of the east and the king of the north come against them, but they will also have sweet testimonies of deliverance through God’s power. This is where message believers got this Chapter completely wrong. They believe that the first six verses are the Cloud coming down to give an open Book of revealed mysteries to William Branham. This is completely wrong. William Branham had to open the Book which took him from 1947 to 1965. The first six verses of Chapter 10 tell of the archangel coming down to first raise the dead. Then seven Thunders enable the church to prepare to meet the Lord by going up in defiance of natural laws. 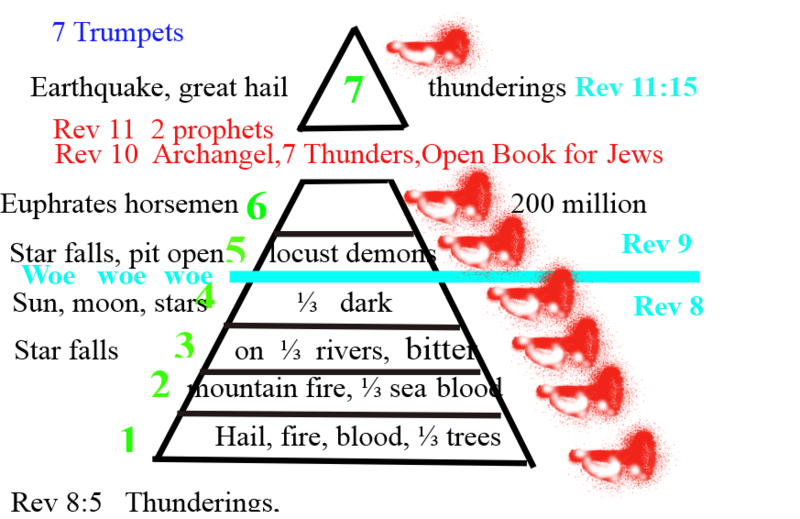 At that time the seven Thunders also give the two prophets to the Jews the authority to over-ride the laws of nature and cause havoc for the antichrist Pope's armies. Finally the archangel hands over the open Book to the two prophets and explains that the mysteries were revealed by the seventh angel. The two prophets then know everything that the Bride knew and in addition they will learn all the mysteries of the Tribulation that we do not know. These two prophets will thus know more than anyone else. This Chapter deals with the ministry of the two prophets who hold back the forces of evil so that the 144 000 Jews can meet the Lord in Israel. 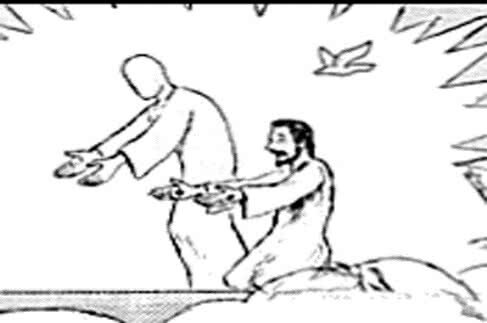 Then the two prophets are killed and raised up to Heaven. This is now basically the end of the Tribulation and thus time to gather the nations for Armageddon so that the Lord can come down and destroy them. The seventh Seal is the mystery of His second Coming. The seventh Trumpet is symbolic of the third Coming of the Lord to win at Armageddon and then set up His kingdom for the Millennium . It is announced with an earthquake and great hail. The twenty four elders bow in Heaven before Jesus. This seventh Trumpet thus has to sound after the saints are taken up to Heaven. This seventh Trumpet angel is a heavenly angel dishing out judgement that brings the Lord down for Armageddon which is the third Coming. The Laodicean seventh angel of REVELATION 3: 14 and Revelation 10: 7 is an earthly messenger who reveals the hidden mysteries of Scripture to prepare the living bride for the second Coming of Jesus. The seventh angel’s message to Laodicea is one of mercy and warning so that we can miss the Tribulation. Judgement will come during the Tribulation for those who reject or mess up the message. We need to be aware that we have a preview or revelation of the seven Seals. The actual opening of the seven Seals only happens when the Bride is taken up to Heaven. Now, we find that after, "After these things." After meant that "After the church ages had ceased." Then John was summonsed to come up higher, "come up hither," which means "come up here." He showed him all that was going to happen in the world of the Church age. Then after the church ages was over, we find then that John was a type of every true believer that will be summonsed by Christ on High. That right? Summonsed, "Come up hither. And it was not until Revelation 5:6-8 (which follows Revelation 4:2-3 in sequence of time) that we see the "Lamb" taking the book from "HIM" That sat on the throne, as indicated in Revelation 4:2-3 and 9-10." Chapter 4 sees John caught up to Heaven to symbolize the catching up ( what people call the Rapture ) when the church ages are finished. Then Chapter 5 comes after Chapter 4 in time sequence. So the 24 elders, 12 of whom are the apostles from the New Testament, are in Heaven when this scene opens. 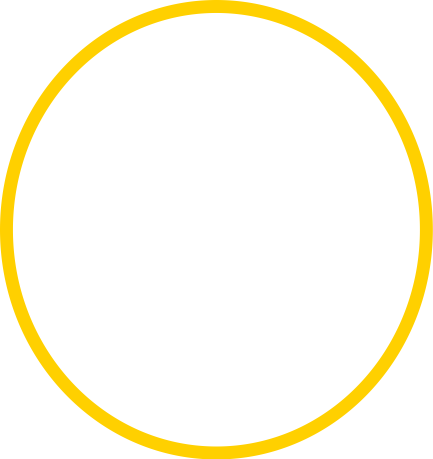 Thus the actual opening of the Seals can only happen when the Bride is in Heaven. We were given a preview of this event when the seven angels brought the basic information as a revelation to brother Branham so that he could preach on the seven Seals. But the actual event, the actual opening of the Seals, is still in the future. God sends a revelation before the event actually happens, so that we can be prepared for the event. Question: “In Revelations verse 5 to 9, who are these found singing when the Lamb takes the Book? Are these the raptured saints”? ……. There's something wrong. There's something wrong. ……... But you see Him stop me on that? Glory. I never read the other part of that. See, I got here: "and..." Look here. "And they sang a new song," and I stopped. See? But look here, "the song they sang, saying, You have redeemed us out of every kindred, tongue, and nation." So the Bride is around the throne of God when Jesus actually breaks open the Seals. We go back to Revelation Chapter 11 and the seventh Trumpet angel. When the seventh judgement trumpet sounds, then the 24 elders fall down in Heaven. So the seventh Trumpet sounds when the 12 apostles are in Heaven. This is after the church is caught up to Heaven. So this seventh angel with the seventh trumpet that is the final Tribulation judgement just before Armageddon that brings forth the third Coming of Jesus for Armageddon, cannot be the seventh angel of Revelation 10: 7 whose main ministry was to reveal the Seals and open the revelation of the written Word to prepare the Bride for the second Coming of Jesus. This is a tricky Chapter as it has a compound meaning. The mighty Angel of Chapter 10 came down for both the Bride and the Jews. 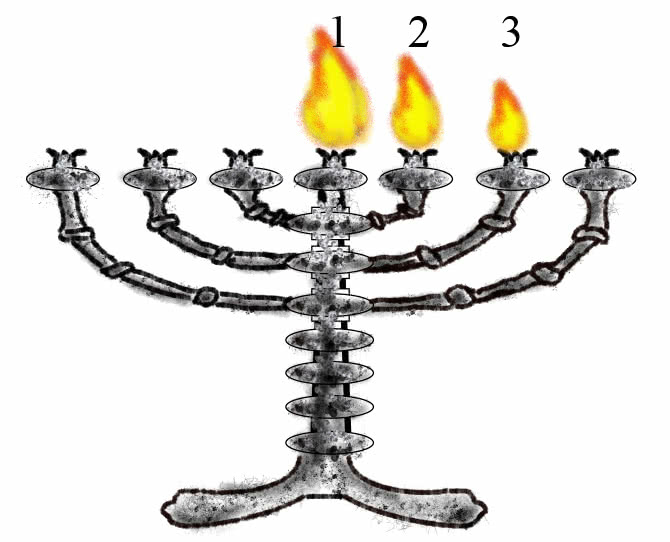 This Chapter represents both the Jews and the church. 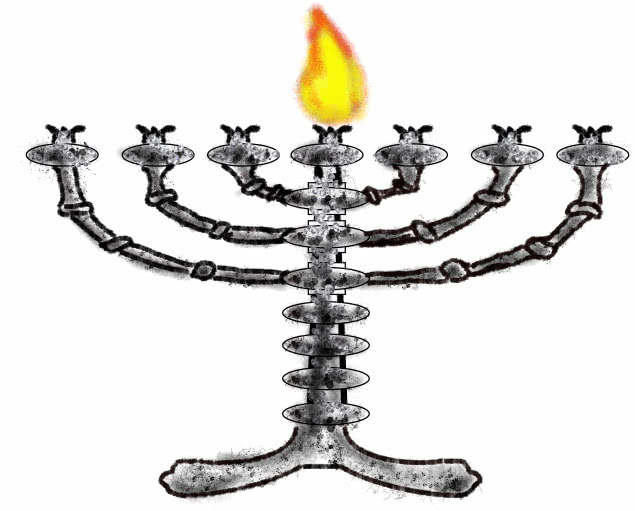 It refers to the Jews when Jesus was born and then taken up to Heaven. Then the Jews are protected as God had to blind them to turn to us Gentiles. They have been heavily persecuted but the souls under the altar in the sixth Seal are given white robes when they are killed. By dispersing the Jews around the world, God has also protected them. If they are killed in one place then the others that are scattered elsewhere survive. Dispersed amongst the nations they were in a spiritual wilderness. Then God would raise up the American super power to protect Israel in the end of the seventh church age. Then it comes back to the Jews in the Tribulation where Moses and Elijah use their power over nature to make the earth swallow up the evil hordes that are launched against Israel. Here the Jews are in a wilderness as all the nations forsake them. President Obama got the United Nations to oppose Israel just before losing power in 2017. Spiritually, this was a foolish move. Opposing the prophecies of the Jews returning to Israel is opposing God's will. When President Trump agreed to recognize Jerusalem as the capital of Israel in 2017 then the United nations opposed him by 128 to 9 votes. Trump very bravely ignored all this opposition. Such is the wilderness that Israel is heading into. Forsaken and opposed by the nations. But two prophets will protect them during the Tribulation. As the Jews faded out when Jesus was caught up to Heaven, the picture changes to cover the Gentile church. A woman represents a church. The crown is first the Jewish church with the 12 tribes of Israel, then the Gentile church of the 12 apostles. The moon is the law of the Old Testament prophets. The sun is the grace of the New Testament apostles. The apostles and the prophets, the New and Old Testaments, guide the Gentile church and the Jews to the Lord. Abraham was about 1900 BC. The start of the Jewish nation. When Jesus was 33 He was very young compared to the age of the Jewish nation. This shows God's long term plan of redemption for the Jews. 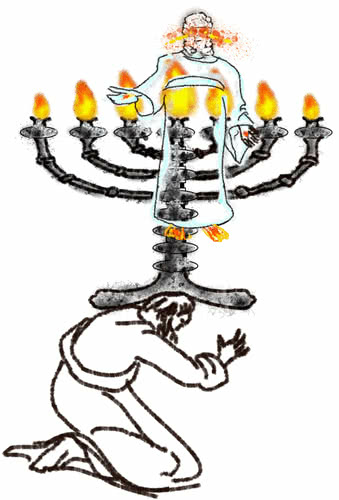 The Jews themselves were spiritually dried out. No prophet had spoken to them for 430 years. Rome had conquered them in 63 BC and imposed harsh, greedy, and corrupt governors on them. Uprisings were savagely suppressed by the sword. The dragon symbolizes Satan. Satan was going to take over the Roman empire and use it to destroy Jesus. Seven heads are the seven hills of Rome. Ten horns are the final ten dictators who who give their military power to the final antichrist Pope so that he can rule the world in the Tribulation. Pompey, the Roman general, conquered Israel in 63 BC, the same year that Julius Caesar bribed his way to being elected as Pontif or Pontifex Maximus, the high priest of the Babylonian mysteries of Nimrod. The seven crowns were the first seven members of the family of Julius Caesar who established themselves as emperors of Rome so that they could rule dictatorially. Julius Caesar was dictator for life. His sister's grandson Augustus was the first emperor. He adopted Tiberius as son. Tiberius was emperor when Jesus was killed. His brother's son Caligula ruled for a few months and then went mad as he thought he was God. He was killed about three and a half years later. ( He thought he was God so, like Jesus, he only had three and a half years of ministry). His uncle Claudius took over and then married the mother of Nero. Nero's mother killed Claudius and then Nero killed his mother and began killing Christians, including various apostles. Then number seven was a Roman general from Spain, Galba, who usurped the title of emperor and was killed after seven months. A military dictator ended the awful family line of Julius Caesar. This family had established the Roman empire. Rome had taken over Israel in 63 BC. When Julius Caesar came to power he made Herod, who was not a Jew, king of the Jews because Herod's father had helped Caesar. Thus Rome put Herod in place to try to kill Jesus when He was a young boy of about two years old. The "tail" of the dragon in the vision represents the "tale" or story that the Devil told the people. One third is not a number of people. God sees the world in three categories. Jews, Samaritans ( half Jew and half Gentile ), and Gentiles. So God sees the Jews as one third of the people in terms of their category, not in terms of their numbers. The children of Abraham are called stars. In other words, the Jewish people. GENESIS 15: 5 And he brought him forth abroad, and said, Look now toward heaven, and tell the stars, if thou be able to number them: and he said unto him, So shall thy seed be. :10 And it waxed great, even to the host of heaven; and it cast down some of the host and of the stars to the ground, and stamped upon them. A horn can represent the power of a state. The little horn is the smallest state on earth, the Vatican. It occupies one square kilometer and has less than a thousand citizens. But it is the head of the Roman Catholic church who call the saints intercessors and pray to them. Praying to the dead is spiritualism. In effect it is as if they remove that person from Heaven because spiritualism has no place in heaven. They make statues or idols of the saints for their churches and buildings and that effectively brings them down to earth. Satan used the religious leaders of the Jews to persuade the Jews who had welcomed Jesus on Palm Sunday to crucify Him on the next Friday. The poison lay in the leadership who told the story or tale but the consequences were felt by the deceived people who were obedient to their leaders. In AD 70, about 1 1oo ooo Jews perished when the Roman general Titus destroyed the Temple and the city of Jerusalem. The Jews who shouted for the death of Jesus has their names blotted out of the Book of Life in Heaven because they had listened to the Devil's unscriptural story. Abraham was about 1900 BC. The start of the Jewish nation. When Jesus was 33 He was very young compared to the age of the Jewish nation which was His "mother" in terms of physical ancestors from whom He was descended. The rod of iron refers to the 1 000 years of peace after Armageddon. Sin will not be tolerated there. So the Jews faded off the scene about 37 years after Jesus ascended to Heaven. They went out with one of the most brutal battles in AD 70 where Rome and her allies did their best to exterminate the Jews. More than a million died. Those kind of casualties are not found again in an attack on a city until we get to the battle of Stalingrad in the second world war when Germany invaded Russia. After AD 70 the Jews revolted against the emperor Hadrian who exiled them from Jerusalem in 135 AD. The Jews disappear off the Bible radar but re-appeared during the second world war in the horrific Holocaust where Hitler killed six million. This was an amateur Tribulation. A preview of the Tribulation to come. 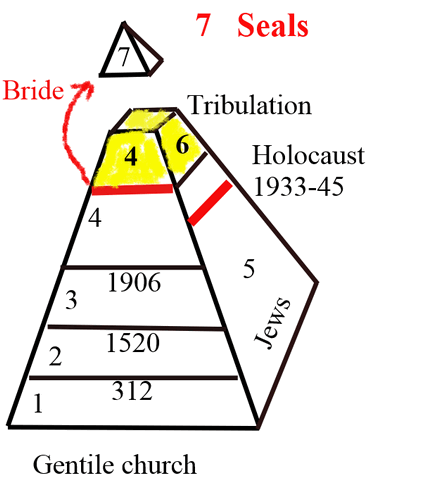 Now the Bible picks up the story of the Jews in the Tribulation. 1260 days or three and a half years is the length of the Tribulation. Forsaken by the nations, Israel is in a wilderness of rejection. When the church is caught up, Satan is cast down from Heaven where he has a place as the public prosecutor or the accuser of the brethren. Then the Tribulation starts as he attacks the Jews and the foolish virgin churches who did not know the Bible. The Holy Spirit leaves the earth to take the Bride up. Life leaves and Death enters the earth. Michael is the archangel whose voice produces the resurrection. So when He casts Satan out of Heaven, then Heaven is cleaned and Michael can then go down to resurrect the saints. Christ calls Himself Michael when He acts as the archangel. The first thing that Lucifer done to separate the fellowship of God and man, he wanted to build him a united kingdom, a greater splendor and seemingly more cultured, a greater kingdom than Michael, Christ had. The serpent finally has a face or a head, the final antichrist Pope. An eagle, with its amazing eyesight, is a good symbol of a prophet. Moses and Elijah, the two great wings of the eagle, protect the 144 000. The two prophets have power over the earth. The earth can open up and swallow their enemies. So the two prophets, as the greatest generals in human history, use the "nature weapon" by interrupting nature with tornados, earthquakes, tidal waves, dense swarms of flies and locusts, intense darkness, painful sores etc to hold off the brutal hordes of the antichrist Pope. The Pope then goes off to destroy the saved Christians who were too slack, overconfident, careless, and lazy to search out the real truth in the Bible. They played "Follow my leader" and fell into the ditch of the Tribulation. Smashed up by the two prophets, the antichrist Pope gets his revenge by exterminating those foolish church members who at least had the sense to get saved before the Tribulation started. When Jesus comes for His Bride then he will no longer be on the mercy seat. Then mercy will be over. This last verse also includes the saved foolish virgins who end up being destroyed in the Tribulation. A woman cuts her wedding dress out of a piece of material. Whatever material did not fit her pattern, is still good material but it is discarded as a remnant. So the Tribulation is where the foolish virgins end up. They were good material, saved Christians. But they did not fit the pattern of the Scripture because they were happy to change the King James Bible for modern versions. They were content to contradict Scriptures when it suited them and ignore other Scriptures as unimportant. Where the Scripture was silent concerning the seven Thunders, they were happy to invent doctrines to describe the unknown. Thus they did not fit into the pattern of God's Word. God then discarded them as a remnant, good material because they were saved, but they had no place in the plan and pattern of God because they never bothered to understand His Word. Now we can turn back in Chapter 12 to see how it tells us of the history of the church. How does 1 260 days apply to the church? A day can represent a year in prophecy. The Jewish month was 30 days. :3 And I will give power unto my two witnesses, and they shall prophesy a thousand two hundred and threescore days, clothed in sackcloth. A score is twenty. If 1260 days is 42 months then each month is exactly 30 days. 12 Jewish months makes their year to be 12 x 30 = 360 days. 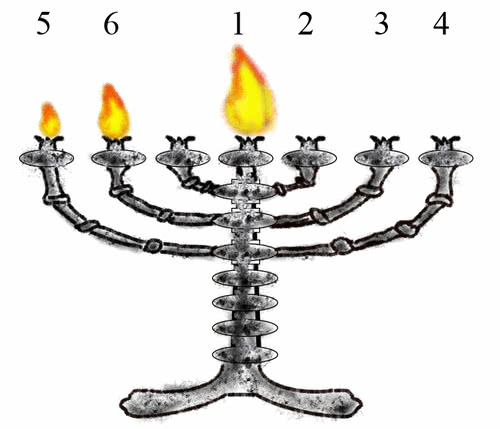 Thus our Gentile year of 365,25 days is five and a quarter days longer than the Jewish year. That means 70 of our years will be about 5,25 x 70 =367 days which is virtually an extra Jewish year. So 70 of our years ( our year's length was invented by Julius Caesar ) is equal to 71 Jewish years. That is the secret to understanding prophecy. The woman ( the church ) flees into the wilderness to escape persecution for 1 260 years. 378 was the crucial year. For the first time the Huns ( who would lead the breakup of the Roman empire which led to the rise of the Pope to power ) were part of a Gothic army that killed emperor Valens and most of his army at the battle of Adrianople. Theodosius was then made emperor. At his death he broke up the empire into two for his two sons. This was represented by the two iron legs of the Gentile image in Daniel's vision. He was the first emperor to refuse the title of Pontif or Pontifex Maximus that Julius Caesar had accepted in 63 BC. This made him the high priest of the Babylonian mysteries. This title was then taken over by the bishop of Rome who is still called Pontif. So the mysteries of Babylon entered the Roman Catholic church to make her Mystery Babylon. Theodosius confirmed the Trinity doctrine as the only truth and began to severely persecute anyone who disagreed with the Trinity. Finally, he acknowledged the authority of the Roman Catholic church over the emperor. The stage was set. The bishop of Rome could now call on the emperor to persecute any heretics who disagreed with the Roman Catholic church. The political power of the emperor was available to the church. Christians had to scatter to remote areas if they wanted to be safe. Tens of millions were killed by the time the killing reasonably stopped around 1700. The most dramatic example of the "church in the wilderness" were the Walsenses. They literally fled into the deep valleys of the Alps where they often froze to death. Somehow, scattered throughout these remote areas they escaped the brutal Roman Catholic armies that tried hard to exterminate them. From about 1150 the Waldensian Gentile believers were protected in the Dark Ages in the mountain valleys of the Alps. 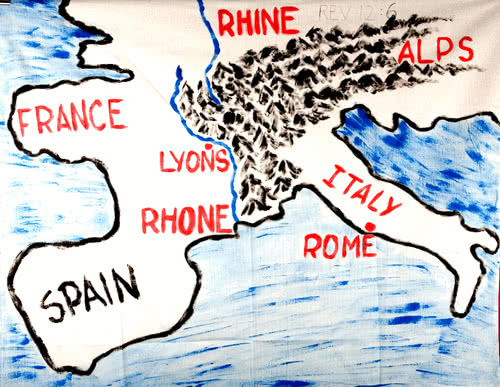 The Rhine river and the Rhone river are shown in the diagram. They managed to spread out through most of the Alps and from there they entered the surrounding countries to spread the Gospel. Their courage and the hardships they endured was legendary. When the Reformation started in 1520 then they were able to find places that were safe from Roman Catholicism. Finally the Pilgrim Fathers escaped overseas in 1620 to America to find a place of safety from Catholic persecution. They landed in Massachusetts where the red dot is near the top of the map. They wanted religious freedom. A church without a Pope. A country without a king. From 378 to 1620 is 1 242 Gentile years. But every 70 years the Jews get an extra year. So divide 1 242 by 70 and you get 17 and three quarters which is almost 18 years extra. 18 + 1 242 = 1260 Jewish years. All Bible prophecy is done in Jewish years. At last the church was safe from Catholic persecution. Protestant Bible beliefs and Protestant honest work ethic would transform this wilderness into the strongest superpower ever seen on planet earth. The Spanish conquered Mexico and South America in the 1500s. They brought with them smallpox germs that the American Indians had no resistance to. The American Indians died in their tens of millions and as a result North America was a large wilderness area with few inhabitants compared to the teeming masses of Europe. These events led to the rise of America from its original 13 states to the modern superpower that was established after the second world war. America in turn protected Israel as they regained their Promised Land. President Truman in 1948 was the first president to recognize the new state of Israel. President Nixon rescued Israel from a sudden Arab attack on their holy day of Yom Kippur in 1973. America’s huge airlift of arms to Israel allowed the Jews to push back and defeat the Arabs. Israel beat the Syrian tanks in the Golan Heights so amazingly that the Americans studied their tactics and changed to smart bombs and guided missiles rather than mass bombing. This made a complete change in modern warfare. Then President Trump announced in 2017 that he would move the American embassy to Jerusalem. Previous presidents were much too scared to do this, including ex-president Obama who voted against Israel just before leaving office. The United Nations voted 128 to 9 against Trump. He simply ignored them. Trump is an incredibly brave man to take on these odds. But America with the world’s best and toughest military, built up in the wilderness that the Pilgrim Fathers originally fled to, is now backing Israel. Truman ( T ) Nixon ( N ) Trump ( T ). TNT. Spiritually explosive. The return of the Jews to Israel to fulfill prophecies that are over 2 500 years old. The world has never seen anything like this before. The United States of America is called USA. Look at Jerusalem. Did you notice Jer USA lem. USA is in the middle of Jerusalem. God knew about America protecting Israel way back in the Old Testament days when this name was given to the city of David. The Star of David is Israel’s symbol and their flag. The oldest name associated with any nation’s flag. 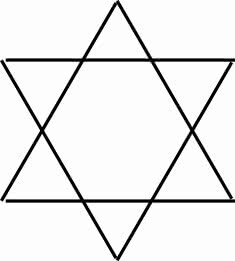 But is there a hidden code in this six-pointed star? Moses led the exodus of the Jewish nation out of Egypt. Then Judges governed them. Then kings tried to govern them. The really good advice they got, which they often ignored, was from the prophets. Then came the perfect Messiah. They simply killed Him. That led to their 2 000 year dispersion amongst the nations. Now they are returning to the Promised Land, but there is no place for a seventh category. So it has to be Moses who awaits them there in the Tribulation. God's plan is always to end up back where it started. The seventh church age must go back to the Bible beliefs of the first church age if we are to follow this simple pattern. The Bride is to marry Jesus. She needs a wedding ring which is a circle of metal because a circle ends where it starts and thus symbolizes eternity. No beginning, no end. But be careful as this is a swopping over time. As God turns to Israel, He is turning away from the Gentile church. Then the Gospel returns to Israel in the Tribulation while most of the saved church which is lukewarm towards being Scriptural in all that they believe, are then hunted down and killed. In the Tribulation you either take on the mark of the beast ( denominational unscriptural brainwashing ) or you die. The wise virgins go to the wedding Feast to eat. The foolish virgins go to the Beast to be eaten. In your forehead is your brain where you think. Once your thoughts are controlled by your church leader then your right hand, symbolizing your works, is also under the control of the church. You then cannot think for yourself. In the same way the Jews who welcomed Christ on Palm Sunday were persuaded by their religious leaders to kill Him on the following Friday. As the beast rose at the Nicene Council, so the image will come out of the World Council of Churches with all ungodly and Satanic power to vent the anger of the devil upon the true vine of God. It will be a repeat performance of all diabolical cunning and cruelty. At the Nicene council in 325 AD the Roman emperor established the Bishop of Rome with political power and religious power in Rome. Constantine himself was moving to Constantinople. He also gave huge sums of money to the bishop of Rome. 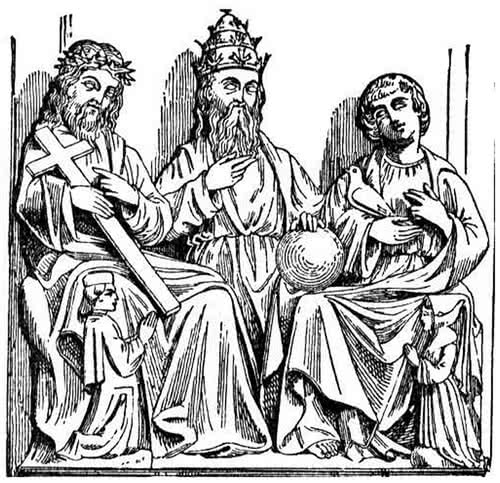 The Trinity doctrine was forced through the Council to become the official doctrine of the Roman Catholic church. This Chapter deals with the rise of the Catholic church to world dominion. This is not the rise of Europe as a second Roman empire to rule the world. The revival of Rome is the rise of the Roman Catholic church as a church and as a money power to take over the world. Their job as the religious denominational leaders is to persuade the Protestants to forsake the written Bible and embrace human opinions and pagan traditions. Christmas and Trinity are unscriptural words that both have a pagan origin. Not to mention easter eggs and easter rabbits. Archbishops. Cardinals. Popes. Pontif. 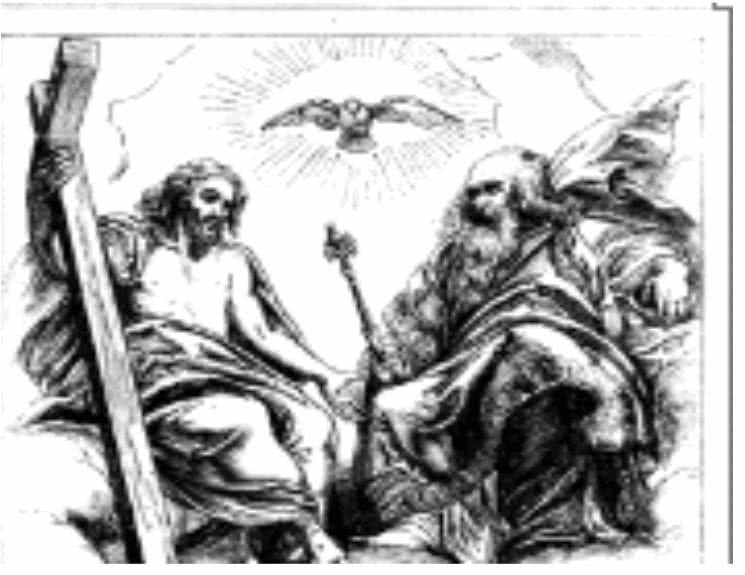 God having no name as He is referred to by His three titles. In the Name of the Father, and of the Son, and of the Holy Ghost. What is that Name? When no one knows, then that church is firmly in the Roman Catholic denominational orbit. The pagan Roman Caesars ruled from the Capitoline hill in Rome. The Temple of Jupiter on the Capitoline hill was the ceremonial head or centre of the Roman empire. 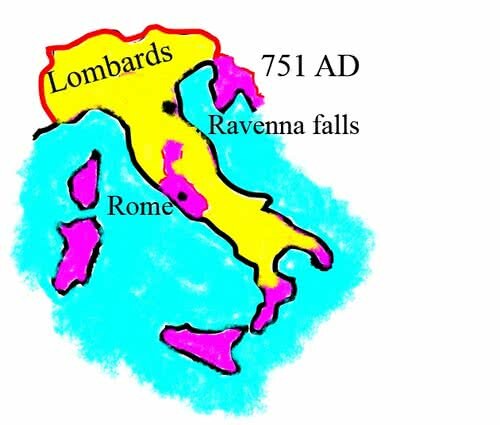 This diagram shows the original seven hills that Rome was built on in Italy. The Caesars were deposed by the barbarians under Odoacer and their world wide power was destroyed. The Capitoline hill lost all its power and authority. Then the Pope slowly rose to power from the Lateran palace on the Caelian hill, which is still the official residence of the Pope. The Pope is now the most influential religious and political figure on earth. The biggest gathering of world leaders was at the funeral of Pope John Paul 2. The deadly wound was healed. The power lost by Caesar was regained by the Pope on a world wide scale. The pagan Romans conquered land but when their empire was too big it bankrupted them by spending all their money trying to defend all their territory. The Roman church is cleverer. It conquers minds and gets its converts to give money to the church. That way it spreads into all nations and gets richer in the process. 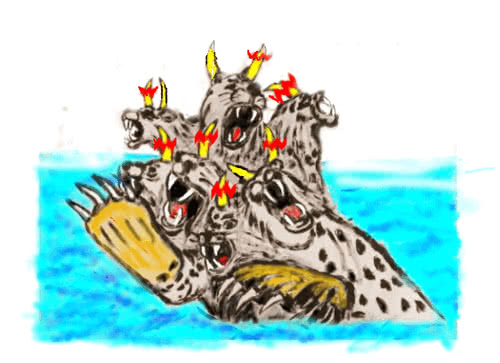 This explains the mystery of the seven headed beast. 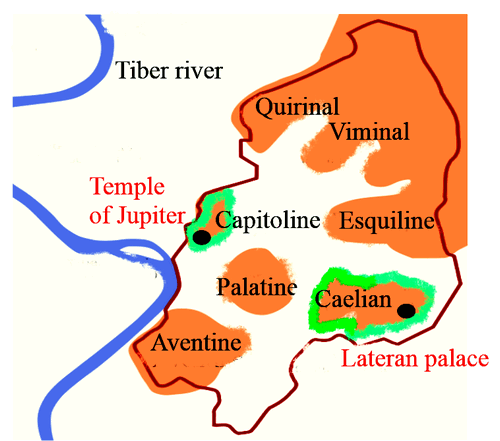 The seven heads refer to the seven hills of the original city of Rome. Romulus and his followers built on top of the hills for safety. When seven hills were occupied they built a wall around them for protection ( the red line ). As soon as a wall was built around a town it was immediately called a city. So Rome became known as the city of Seven Hills. The sea represents the restless nations of Europe amongst whom the Roman church rose to power. This seven-headed beast represents the revival of the roman empire as a church power and a money power. The Roman church is bigger than all the protestant churches put together. The Pope gets more press coverage than any other religious leader. Russia don't reign over all; we don't reign over all. There's only one king that reigns over every... like that Nebuchadnezzar's iron running out to every one of them toes, that it's Rome. Rome don't do it as a nation; it does it as a church. Europe is not the revival of the Roman empire. Rome wants to rule the world. The only way Rome can do that is as a church with religious deception ( white horse ) and as a political power ( red horse ) as well as a money power ( black horse). Today these three horses are uniting, waiting for their rider called Death. No nation can rule the world physically by occupying the land. England had more ships than the rest of the world put together which enabled them to occupy one quarter of the world in the days of their empire. But the second world war bankrupted them and their empire broke up. The communists rose to power after the first world war and soon dominated about one third of the world before Russia was bankrupted. They are still powerful but their money is limited. China was more clever and adopted a communist government with a capitalist economy and they grew powerful. They are not trying to conquer too much territory but are also operating as a money power to invest and gain more control over other countries. Rome was learning. Occupying the land created too much expense and opposition. But as a church, the Pope could rule the minds of people and become a serious financial power as believers happily contribute to the church to secure their place in Heaven. By claiming to be the successor of saint Peter who was given the keys to Heaven, the Pope gains a huge following of people who want to go to Heaven. Notice that Peter who has the keys to open the Door is now regarded as being more important than Jesus Who is the Door. This is an awful mistake. Satan rules politics. So Satan has boosted the rise of the Pope to achieve political power. Jesus turned down political power when Satan offered it to Him. “Who can make war with the Pope?” No one. Communists tried to destroy the Roman Catholic church in Poland but the Polish Pope John Paul 2 was instrumental in breaking Communism in Poland which led to Russia losing her hold over Eastern Europe as communism fell. So world rulers treat the Pope with respect. He has twelve hundred million Catholics world wide who support him. Roman Catholics are in every nation and would oppose any attempt to declare war on the Pope. The Vatican backed Hitler and the Nazis but got away with it because everyone was too scared to make too many accusations against the Pope. Such is his influence because of the millions of Catholics that are scattered around the world. Very little Roman Catholic doctrine is Scriptural. Indulgences were sold whereby Catholics were granted forgiveness of sin if they paid money. The Pope has the authority to release a soul from purgatory if some living person pays in money to the Catholic church. Pope Francis has now given priests permission to forgive women for having an abortion. The Pope, by claiming power to forgive sin, now puts himself in the place of God. Forty two months is three and a half years. This is the length of the Tribulation. That is when the final Pope will rule supreme over the world. Be careful when a Pope takes on the name of Peter 2. The founder of Rome was Romulus. The first emperor was Augustus. The last emperor was Romulus Augustulus. Somehow the Romans managed to get the last person to have the same name as the first persons. Their version of “first and last” as they try to imitate a title of Jesus. Peter was their first Pope. So they claim. However even this claim is false because the bishop of Rome only began to call himself the Pope around the year 400 AD. Hundreds of years after Peter’s death. So Peter 2 would be a suitable name for their last Pope. “In the name of the Father, Son, and Holy Ghost “ is not a name. It is a string of titles. But that is how the Roman Catholic church got rid of the name of God and then they persuaded the Protestants to follow this example. Their prayers to Mary and the dead saints is just another form of ancestor worship. And it was given unto him to make war with the saints... (And he did.)... and to overcome them:... (He did: burned them to the stake, fed them to the lions, and killed them any way he could.)... and power was given him over all kindreds,... tongues, and nations. Tens of millions were killed by the Roman church until mercifully, around 1700 this awful habit had reasonably stopped. But a second beast or power arises from the earth. Sea represents the crowded countries of Europe. Earth represents the thinly populated plains of America. The Spaniards brought smallpox and other diseases to Mexico and South America. The Indians had no resistance to this so they died in their tens of millions. When the Pilgrim fathers got to Plymouth Rock in Massachusetts in 1620, in order to escape persecution in Europe, there were not that many Indians on the land. These Protestants wanted a country without a king and a church without a Pope. They wanted freedom of religion and speech. ( The two horns of a lamb ). Congress could close a port but not a citizen’s mouth. Great men like Washington and Lincoln were their early leaders. But as the country grew in power so godliness gave way to power politics and the unscrupulous and addictive love of money. The churches became politically involved. The Pentecostal outpouring in 312 Azusa street in Los Angeles in 1906 became organized denominations by 1917. The end time message of William Branham that was to teach us how to return to the Bible beliefs of the New Testament church, splintered into numerous groups like a cracked mirror as pastors preferred to interpret his quotes to suit themselves in their mad rush to be considered clever. They should rather have used the quotes to join the Bible verses together and develop Scriptural doctrines. America has the financial power to support denominational beliefs around the world. One report claims that there are far more full time ministers in America then what there are in the rest of the world put together. The American churches spread the Trinity doctrine ( copied from the Catholics ), Christmas festival ( copied from the Catholics ), having a pastor in charge of a church ( copied from the Catholic example of having a priest in charge of a church ), political involvement by the churches ( copied from the obsession with politics of the Catholic church ), inability to explain what original sin was because they claim that an apple or a fruit was eaten ( copied from the Catholics ). This fruit can only be symbolic and not literal fruit because God declared every fruit tree was good on the third Day. Jesus said no one is defiled by what they eat. So the tree of knowledge of good and evil was not a natural tree. :13 And the evening and the morning were the third day. All fruit is good and nothing that is eaten defiles a person. So the Catholic church and the American churches that follow her, cannot explain why Eve ate a fruit and got punished in childbirth. They also cannot explain why God never told Adam and Eve to repent. So the churches remain in complete ignorance of what original sin was. And they are complacently content in their ignorance. 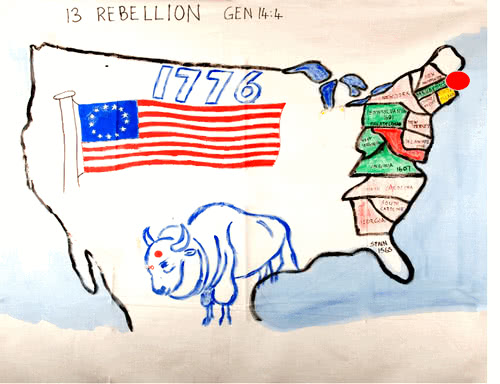 13 is America's number as she started with 13 colonies. So 13:13 is an American scientific special. Science and technology are America's strong point. Great scientific wonders. America exploded the first atomic bomb over the city of Hiroshima at an altitude of about 700 metres. A fireball rained down to devastate the city below. A great scientific invention that was both inhumanly cruel and yet ended the war and saved many lives. Ours is a dark age. The tree of scientific knowledge has poisoned roots. Human inventions easily have downsides. Like medicines that heal also have side-effects. The Americans were first ( and by 2017 the only people ) on the moon. The space capsule that returned at some 40 000 kilometers per hour burned its way for three and a half minutes like a fireball through the friction of the atmosphere. This was literally fire falling down to earth until the capsule slowed sufficiently in the denser air lower down, and the parachutes could open. American scientific prestige is recognized world wide. Especially since they won the space race to the moon. The miracles that American churches are performing today is to use the power of church organization and big money to unite the Protestant denominations into an image or copy of the Roman Catholic denomination. Bible doctrine is being slowly phased out. Disco music for praise and worship is spreading. Love and fellowship is emphasized. Bible beliefs are just so “yesterday”. Not to be taken seriously. Evangelical churches emphasize salvation and living a good, clean life. That is in their favour. Some emphasize speaking in an unknown tongue. After that it is simply “come to church regularly and you will make it”. As knowledge of the Bible fades, so there is less and less to keep the churches apart. The pastor does all the thinking, the people are just along for the ride. When Bible-illiterates from different churches get together they can easily agree on the few Bible basics that they still ( mercifully ) know. Doctrine is minimalized. “What is the minimum that I need to know?” is the supposedly smart answer. The Roman Catholics, to avoid prophecies referring to them, pushed all the prophecies into the future into the great Tribulation. Protestants eagerly followed this idea. Listen to them preach and the two thousand years of church history disappears from the Book of Revelation as it all gets pushed into the future Tribulation. Not much to disagree about there as the Bride is not going to be in the Tribulation so who cares if you’ve got the prophecy right or wrong. So all the prophecies in Revelation are to tell the foolish virgin what is going on when they are doomed in the Tribulation anyway. No prophecies to help the wise virgins understand the church ages. Ironic. What then makes them wise? The Protestants now all believe in a seven year Tribulation, the Jews rebuilding the Temple in the Tribulation, a leader of the European Union being the final beast, a peace deal between Palestinians ( who did not have any state before 1967 ) and Israel being the main focus of Bible prophecy. None of these beliefs can be run through the Bible, verse by verse. They are all delightfully vague when it comes to details. So the Protestants who believe all these errors are the “knowledgeable” people who unknowingly waste their time building up fanciful theories along these lines. But as long as you accept the main outline, you are in with all the others. A brotherhood of error binds people together. The church wants to control politics. Money is the life blood of any organization. Only America has enough money to establish a world-wide denominational system that is Protestant in name but has so many Roman Catholic beliefs. A universal Protestant church system as an image of the original Roman Catholic denomination. We live in an age of a denominational glare, not in the Light of the Word. Denominational brainwashing. In the forehead is the brain. The churches control people’s thinking and cleverly lead them away from Scripture into man-made opinions. Christians no longer prove their beliefs by following their ideas through different verses of the Bible. Christians regard what their church teaches as more important than what the Bible says. We trust the church more than what we trust the Bible. Once the church controls our thinking, then it also controls our actions, symbolized by the right hand. We then belong to the church, not to Christ. Now, it brought forth this great Eden that they now live in, a church world's Eden. They're all uniting together now at the great Ecumenical Council, and going to have the world church all coming under one head, where Satan will be throned, just exactly. Notice his plans to build a super denominational church, the World Council of Churches, see, a super denominate, so that all the world will worship him, the beast, under the name of united Christianity. Would you like to read that in the Bible? Revelation 13:6 and 8. It's a modern tower of Babel. But those who are elected will hear the Word and come out of it. The church will achieve world-wide dominion. Round about 750 AD a document was forged called the Donation of Constantine. This claimed that Constantine promised to give the Pope all the territory in Italy and the West. This document saved the Pope from being defeated by the barbarian Lombard tribe which invaded Italy in 751 AD. They took over the territory of Italy shown in yellow. The Pope begged Pepin the leader of the Franks in France to drive out the Lombards, which Pepin did. The Pope convinced him that Saint Peter alone had the keys of Heaven and that these keys were only passed on to the Popes who were the successors of Peter. This worked well for the barbarians. It was a deal. If a barbarian protected the Pope in Rome, then Peter would open the door to Heaven for that person. This doctrine gained the Pope enormous prestige amongst the pagans. It was unbeatable. Only the Pope had the keys to let you into Heaven, based on the reputation of one man, Peter. Only Peter was given the keys to Heaven. ( Jesus is the Door to Heaven but Peter is now claimed to be more important because he has the keys to the Door and can decide if he wants to open it or not ). So the Pope became more and more powerful. If you were helpful towards the Pope, Peter was your friend. This forged document had one interesting sentence. “As the blessed Peter was constituted Vicar of the Son of God on earth, so it is seen that the Pontiffs, his successors, hold for us and our empire the power of supremacy on the earth". The Pope is the successor of Peter. Popes still claim that today. Peter, a man, is called “Vicar of the Son of God”. In Latin : VICARIVS FILII DEI. This all adds up to 666. ( The Romans used a V for U as it is easier to carve straight lines on rock. Only one man, Peter, was ever called VICARIVS FILII DEI. But the Popes have used the reputation of that man to claim supremacy over the church because they claim to be the successors of Peter. Making your entrance to Heaven depends on Peter instead of Jesus, as Peter decides “yes or no” whether the Door should be opened. That is about as bad as it can get. Peter is not to be blamed because he never ever claimed anything like that. Peter did open the Door to Heaven with the keys he was given. :39 For the promise is unto you, and to your children, and to all that are afar off, even as many as the Lord our God shall call. The second beast, Protestant America, will work together with the first beast, the Roman Catholic church, and force the world to pay homage to the first beast. America rose to world leadership in order to fulfill this prophecy. 13 is a number that has much significance in terms of America. America started with 13 colonies when they declared independence. They have 13 red and white stripes in their flag. The motto on the American seal is “E Pluribus Unum”. “Out of many, one”. 13 letters. At the top is a cloud that surrounds a blue field of glory. In this field are 13 stars. 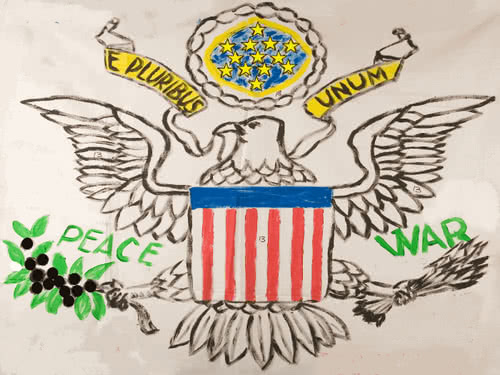 The eagle on the American seal holds 13 leaves on the olive branch as a symbol of peace. There are also 13 olive berries on the branch. Landing on the moon was the biggest peaceful scientific venture of the last century. Three astronauts were in each Apollo moon rocket. The first manned moon rocket flights were Apollo 7, 8, 9, and 10. Four rockets with 3 men each made 12 men. So Neil Armstrong was the 13th man involved in the race-to-the-moon when he stepped onto the moon in 1969. This moon landing gave America a huge scientific reputation. By 2018, 49 years later, no other nation had landed a man on the moon. The eagle on the American seal also holds 13 arrows as a symbol of war. The essential nature of the atomic nucleus was established with the discovery of the neutron in 1932. Then the race was on to split the uranium atom. The atomic bomb, the ultimate weapon of war, was exploded 13 years later by the Americans in 1945. This made American science both famous and feared.